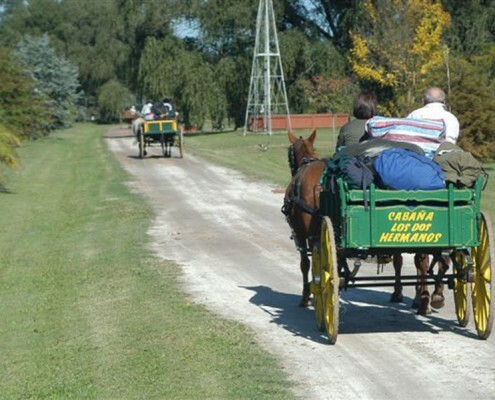 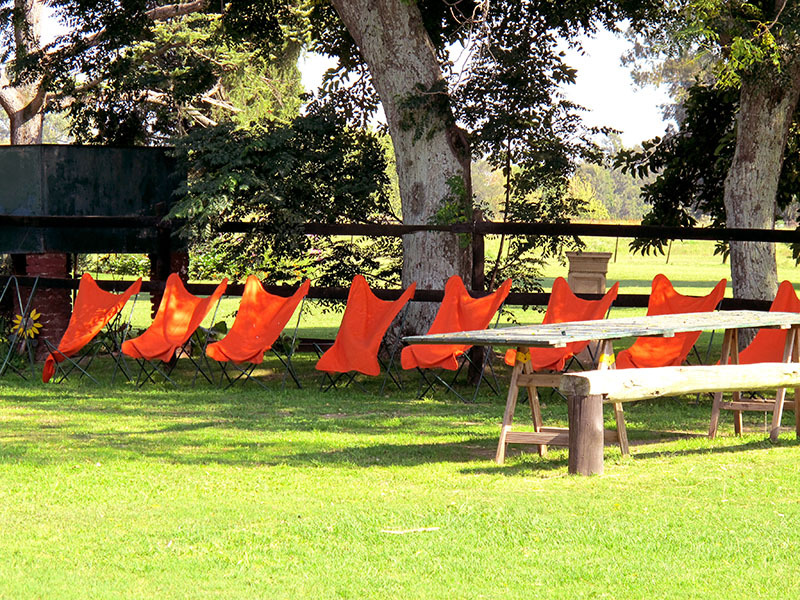 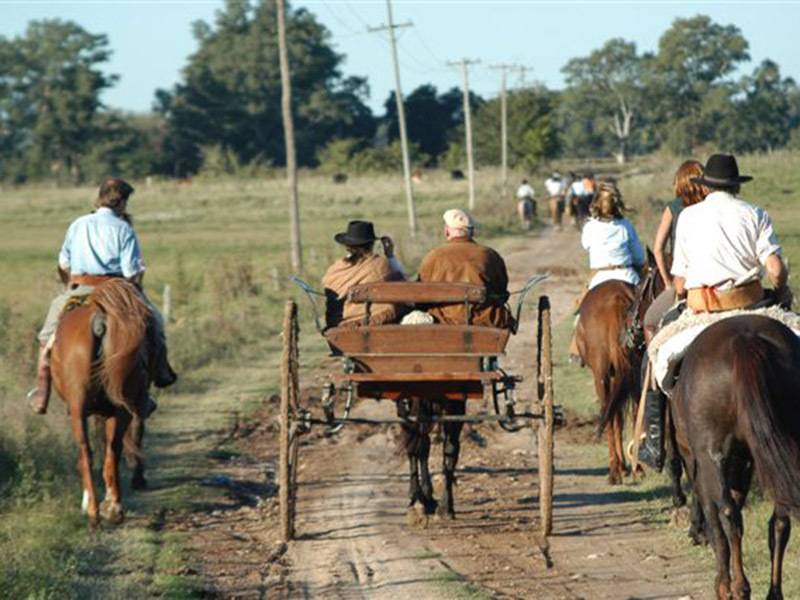 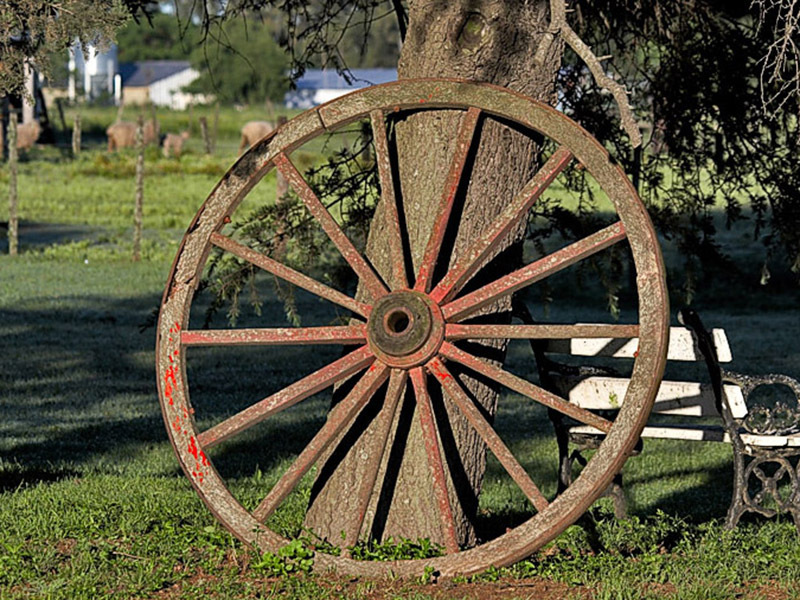 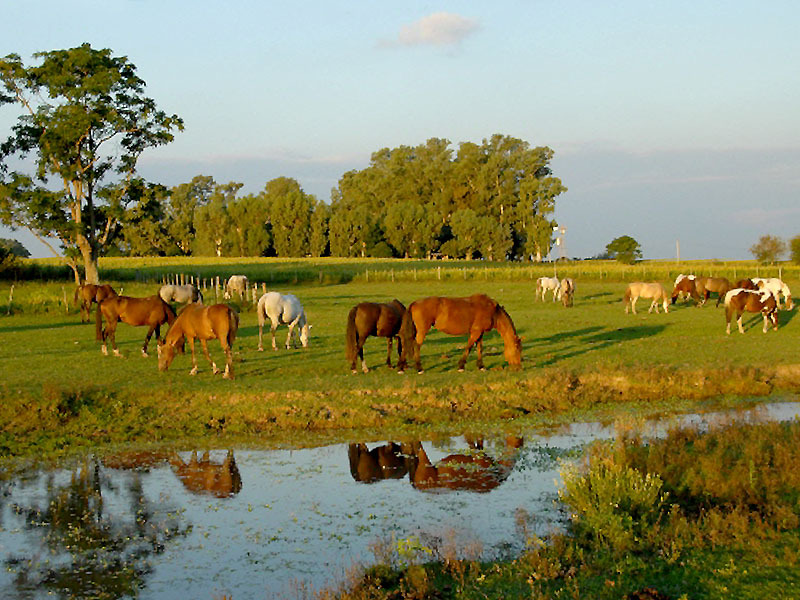 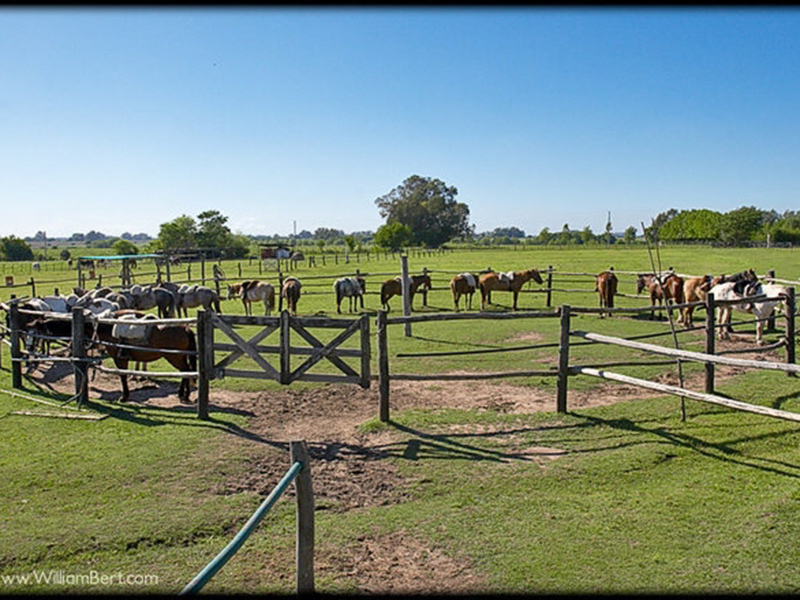 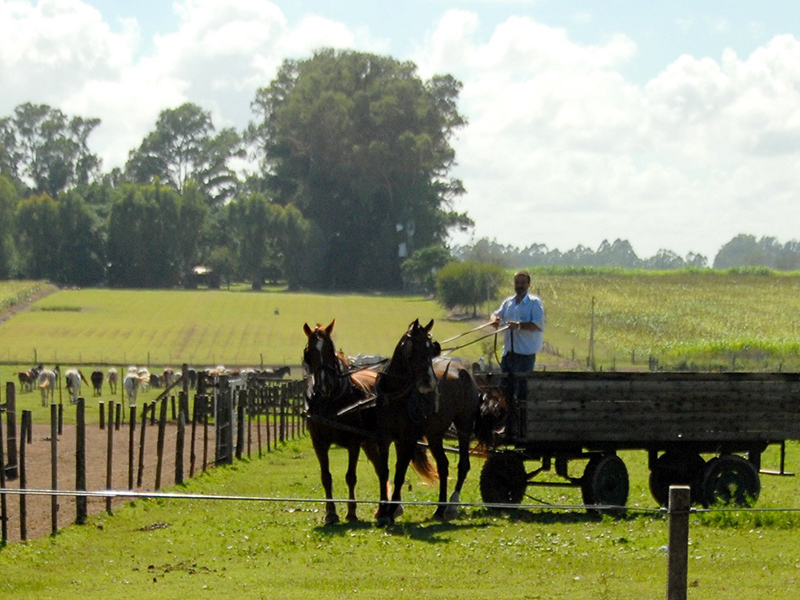 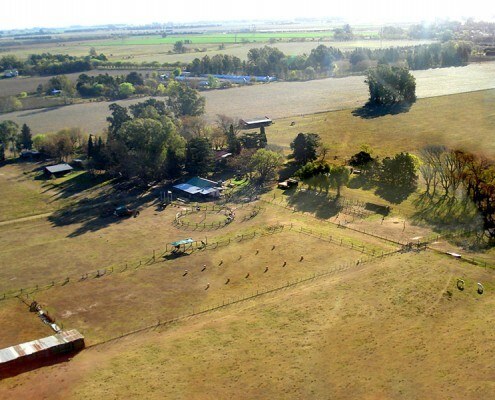 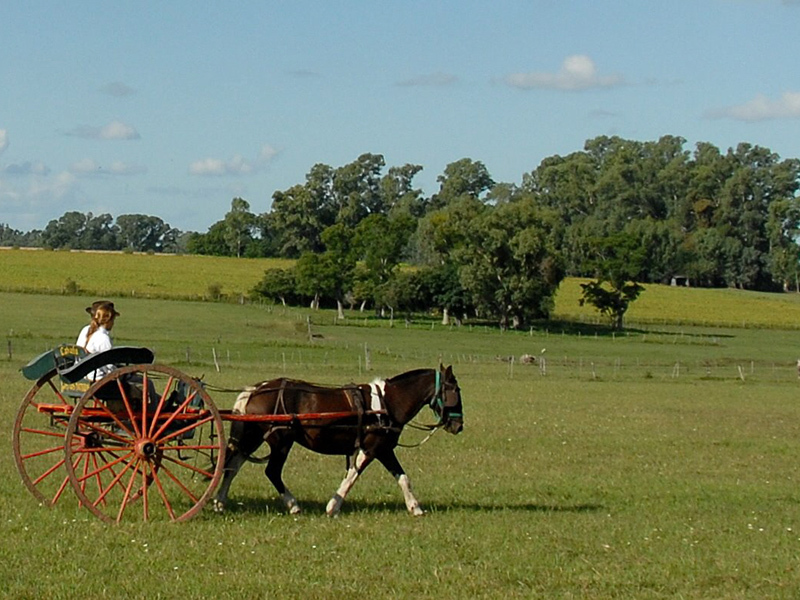 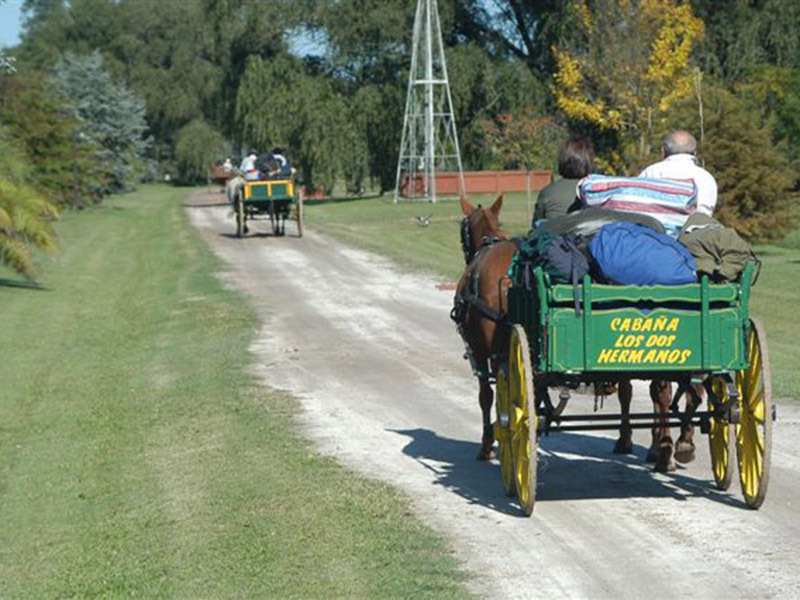 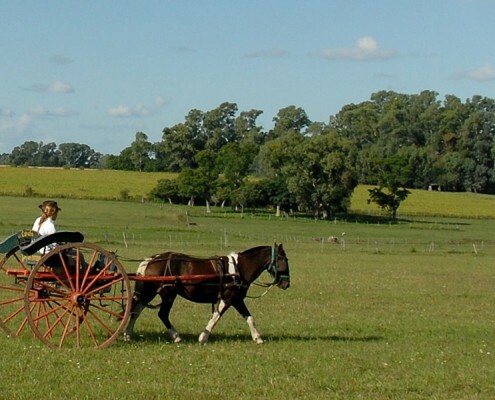 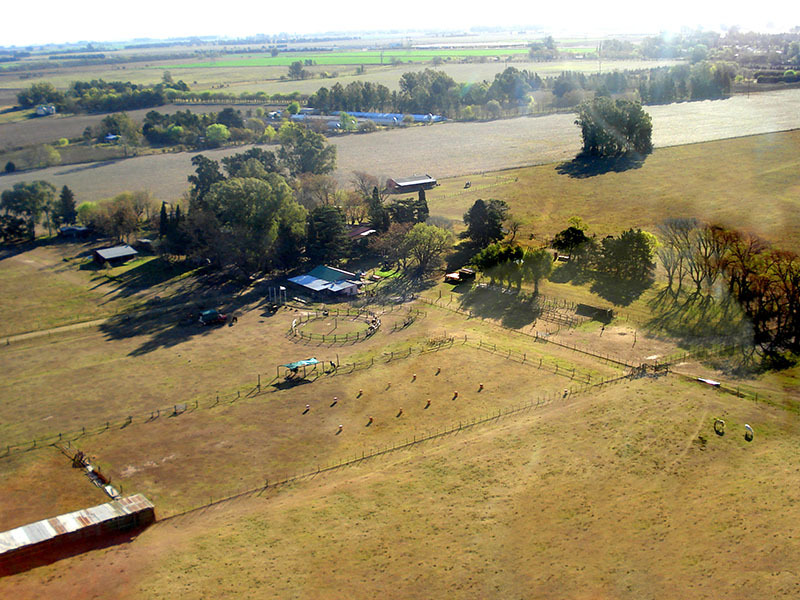 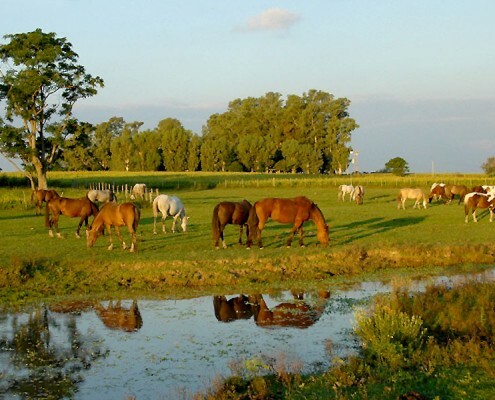 We invite you to discover the authentic Argentinian Countryside at its best, only 60 minutes away from Buenos Aires city center. 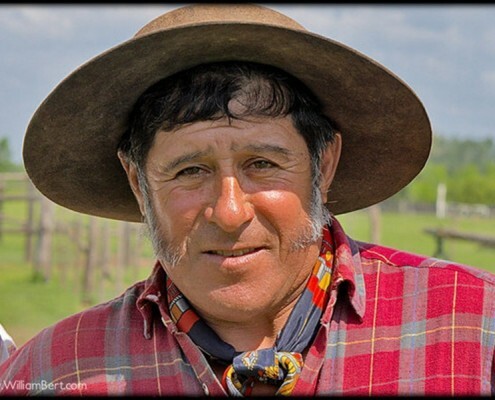 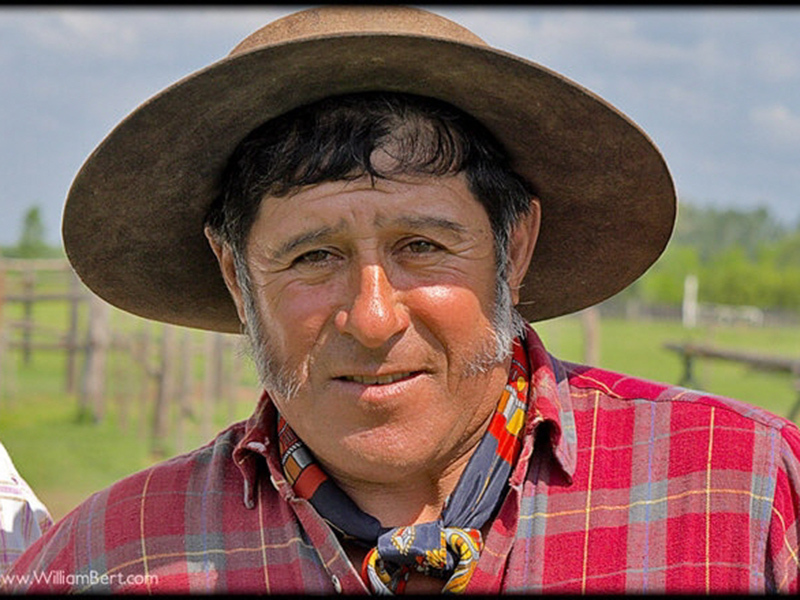 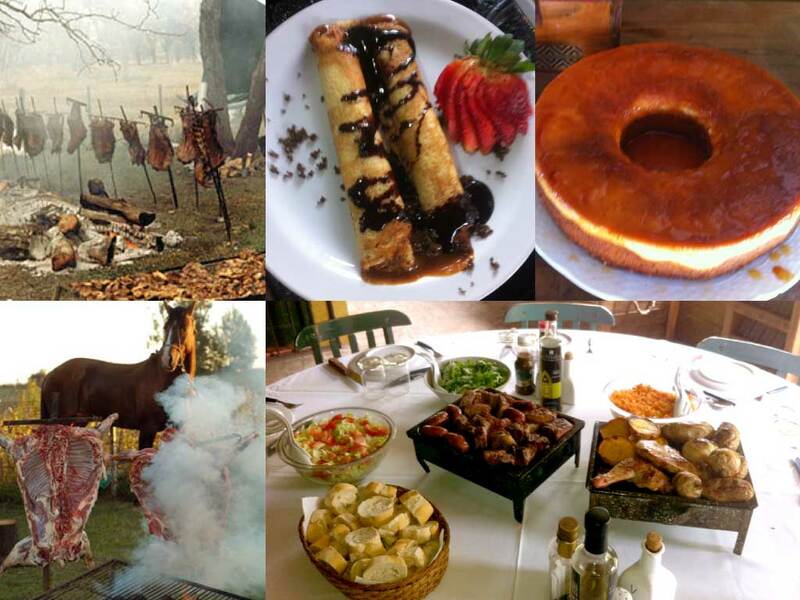 You will experience the real gaucho life in the Estancia, taste the delicious “asado”, different types of meat, salads, wines and all meals. 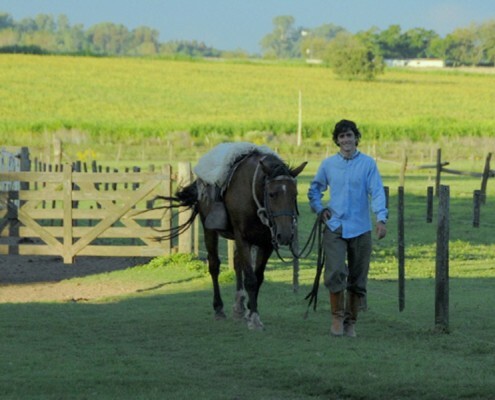 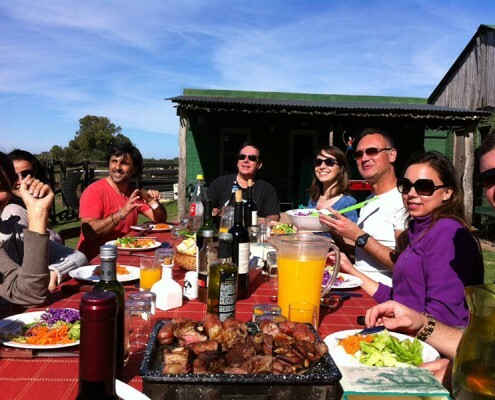 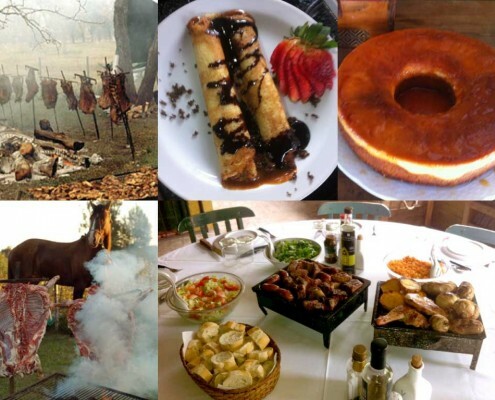 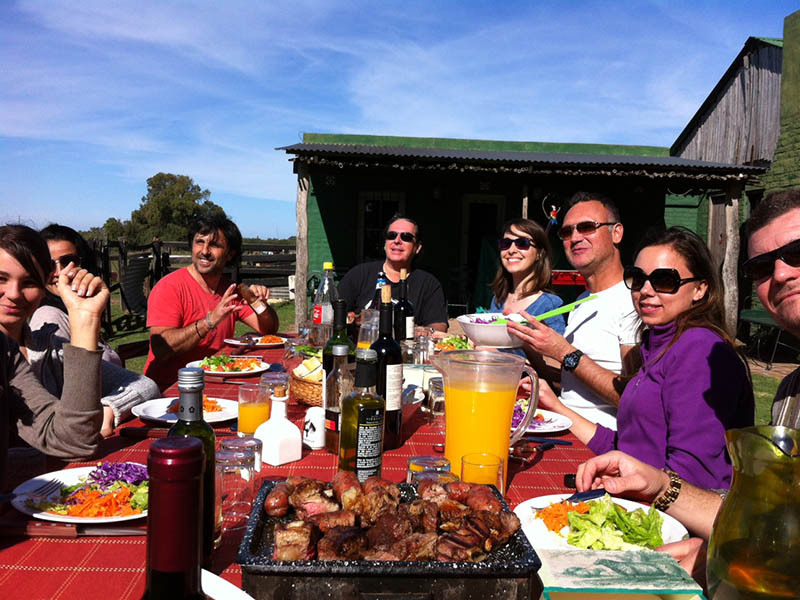 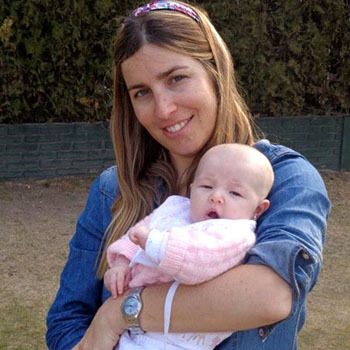 You will have the best and most unforgettable experiences of our best Argentinian traditions. 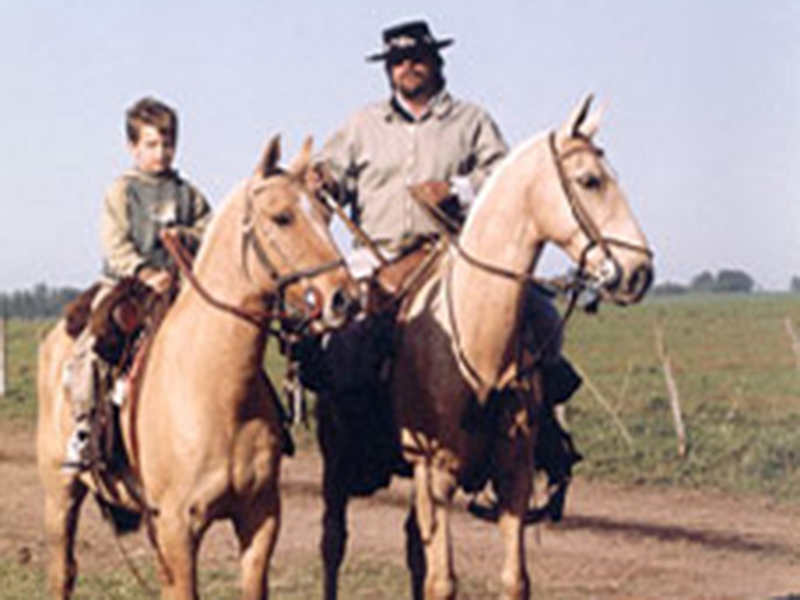 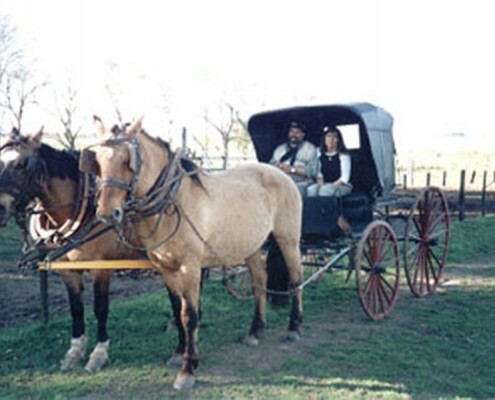 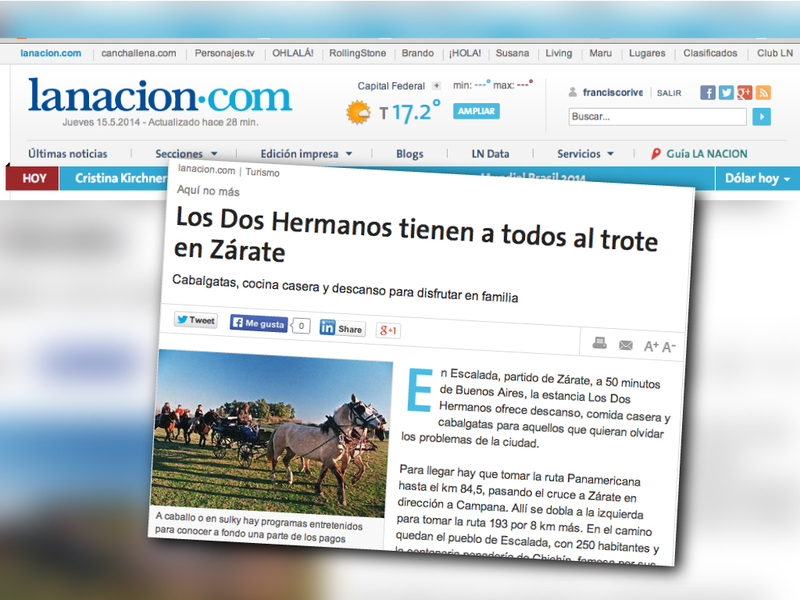 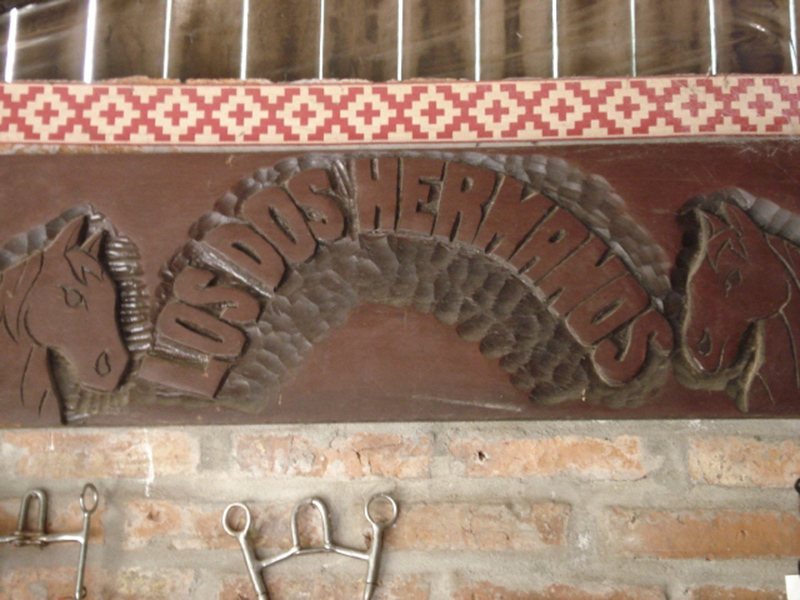 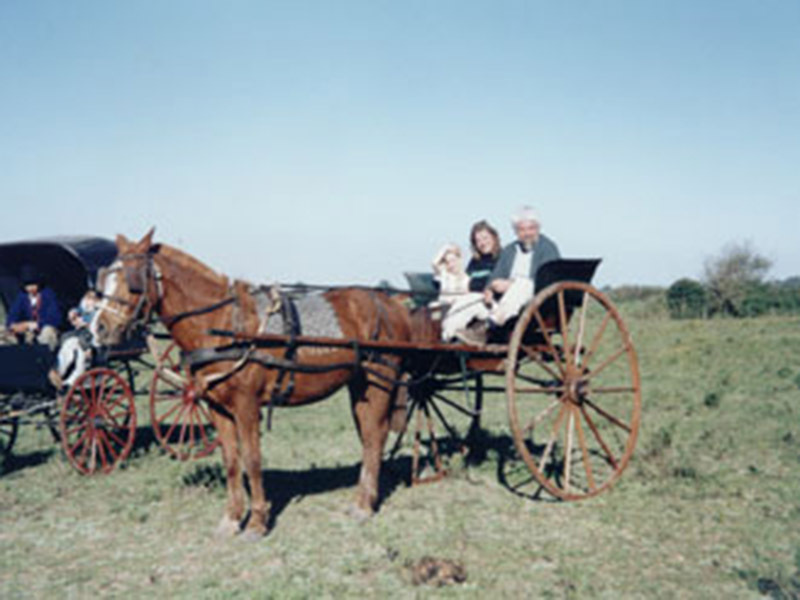 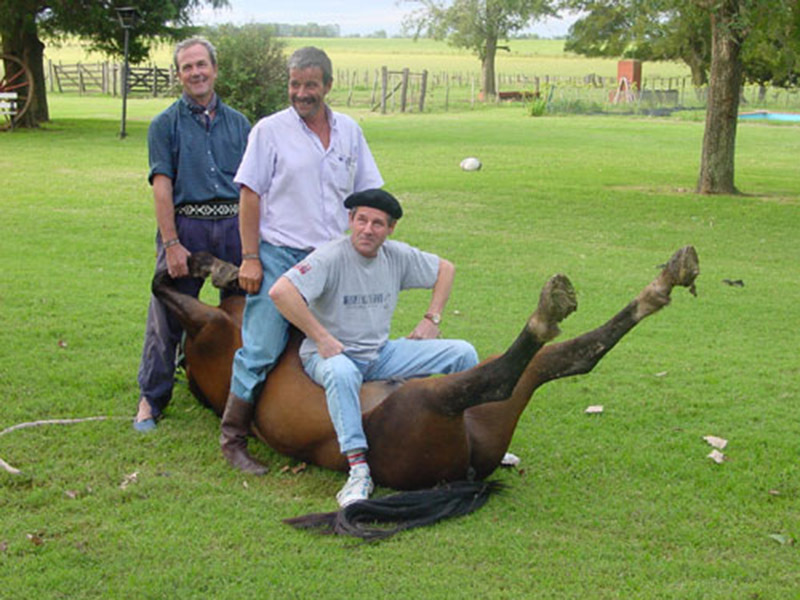 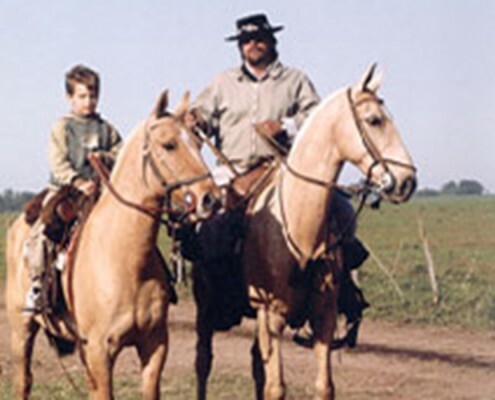 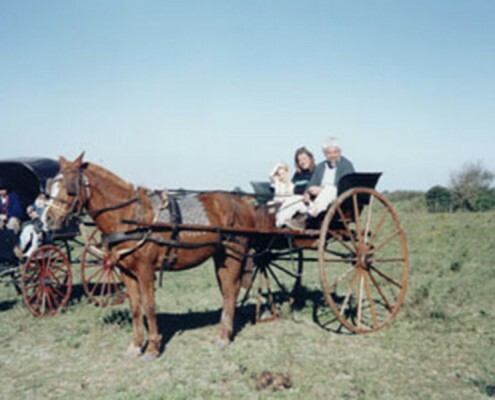 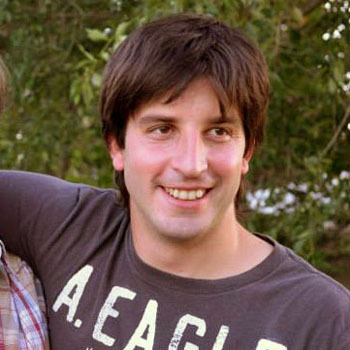 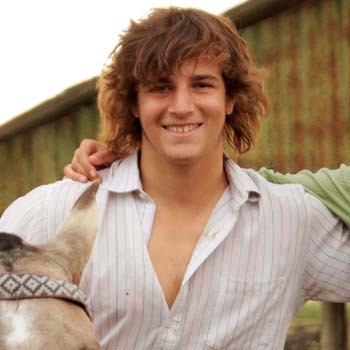 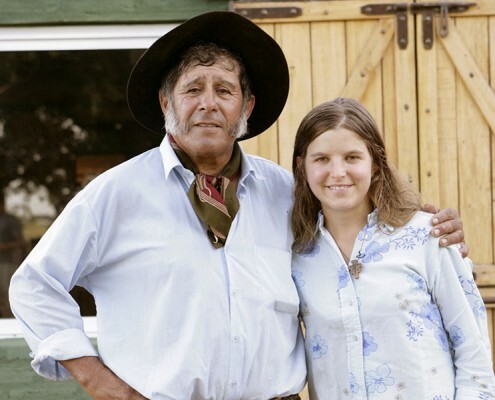 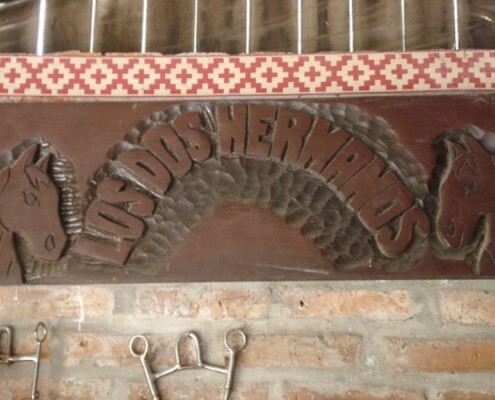 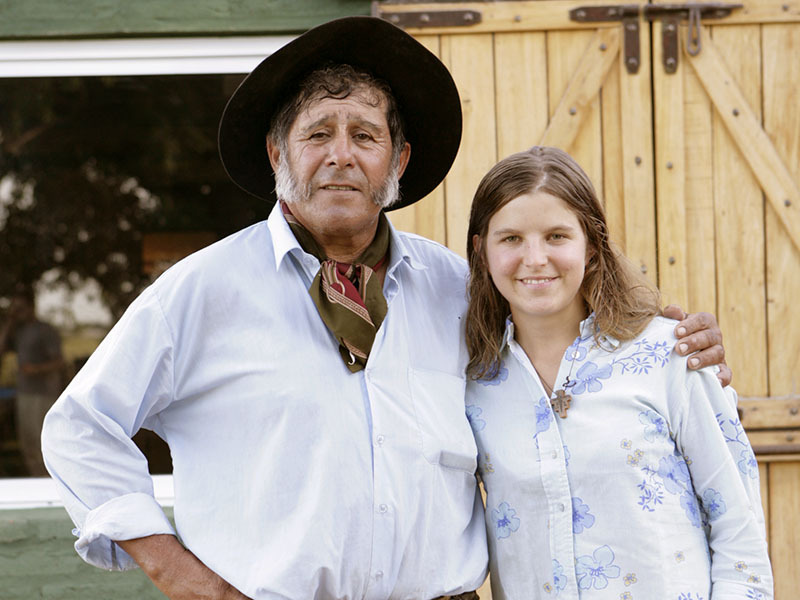 “Los Dos Hermanos” is our own traditional family’s ranch. 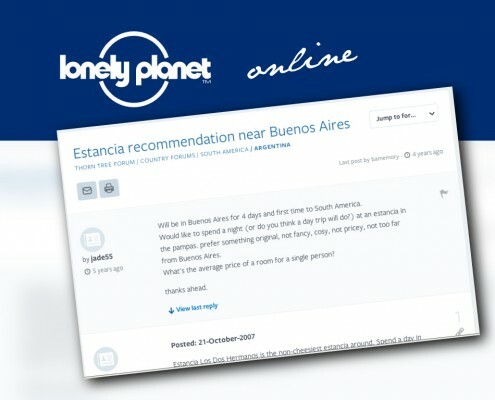 We ourselves will host you. 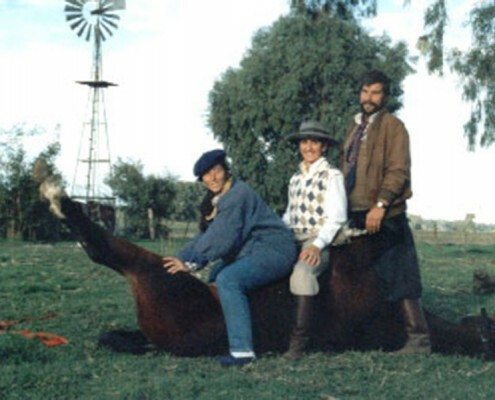 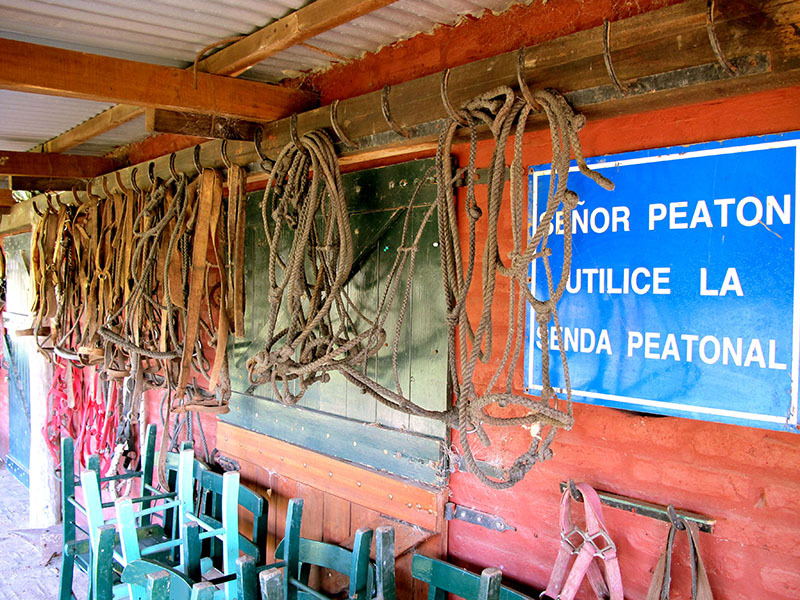 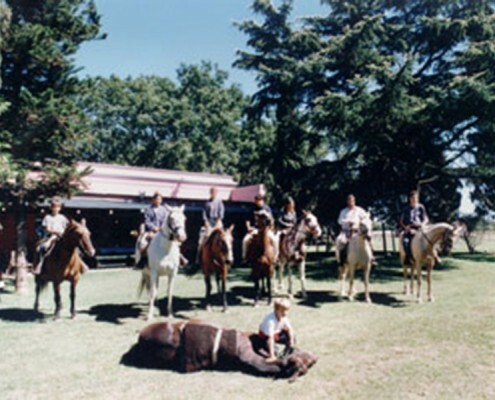 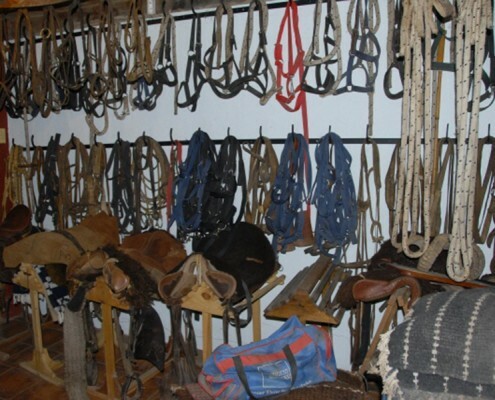 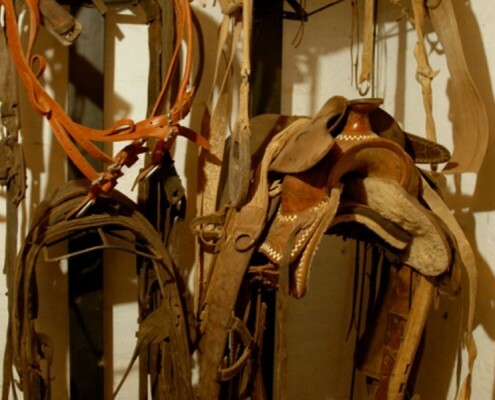 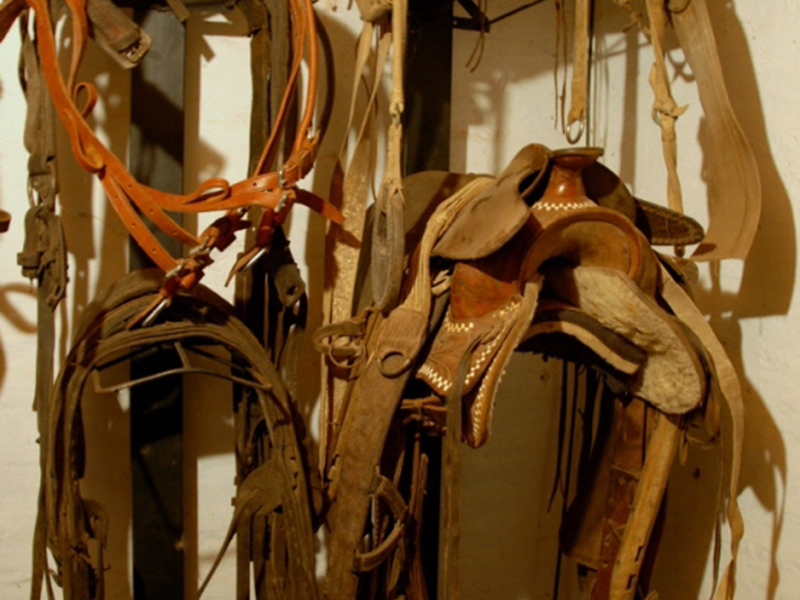 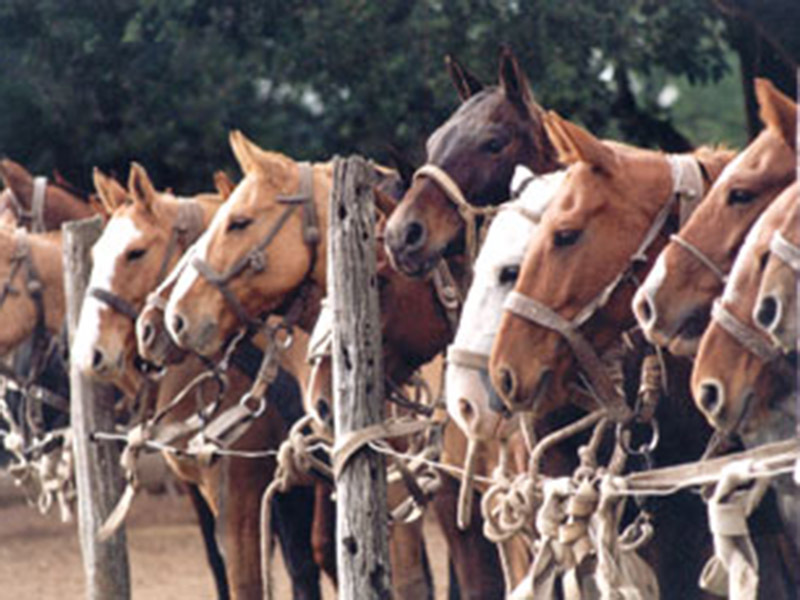 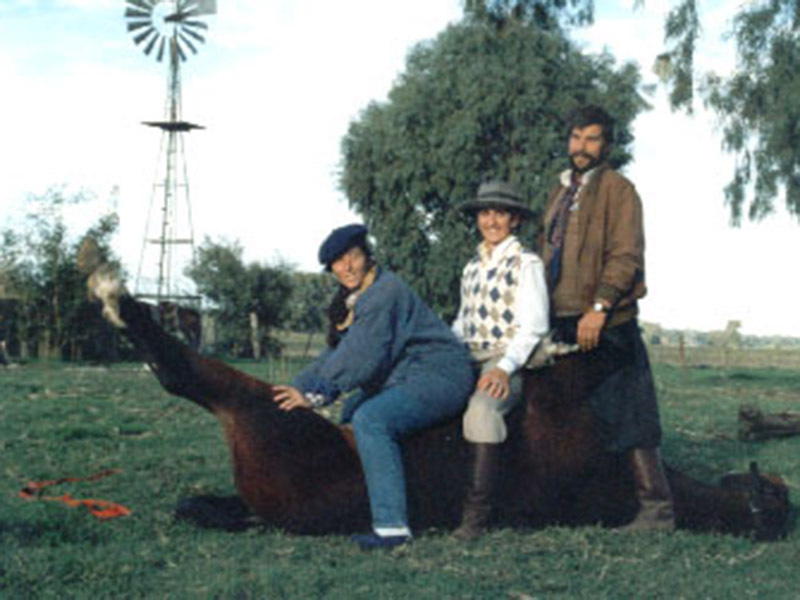 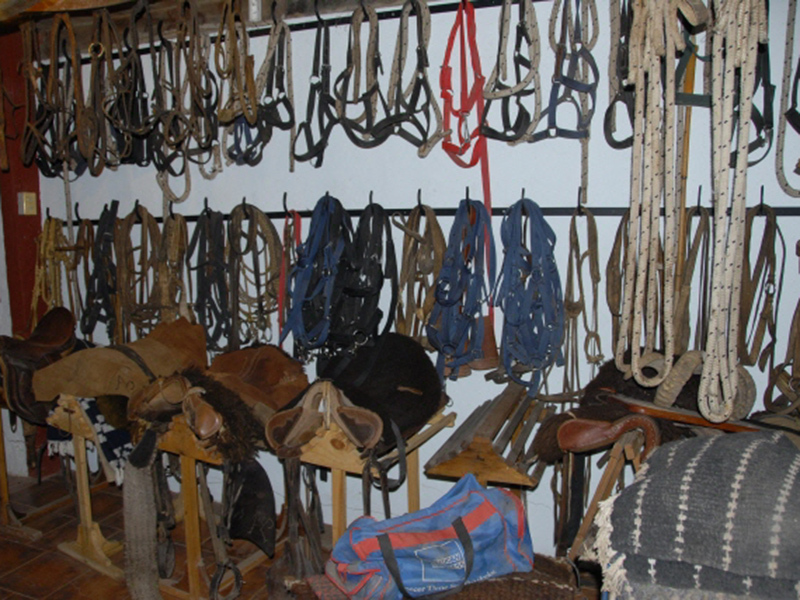 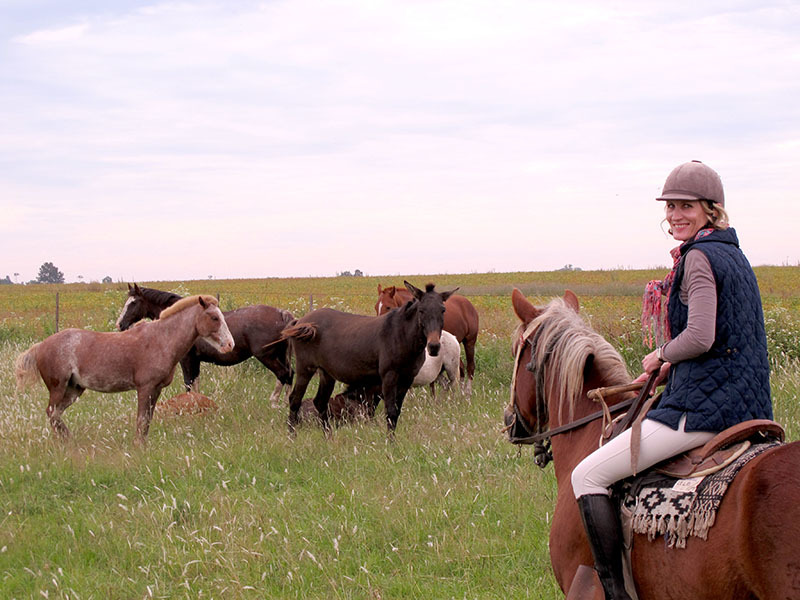 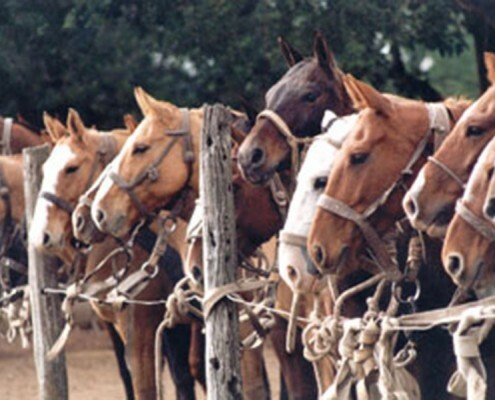 We own more than fifty experimented and trustworthy horses of diverse breeds, equipped with a great variety of saddles. 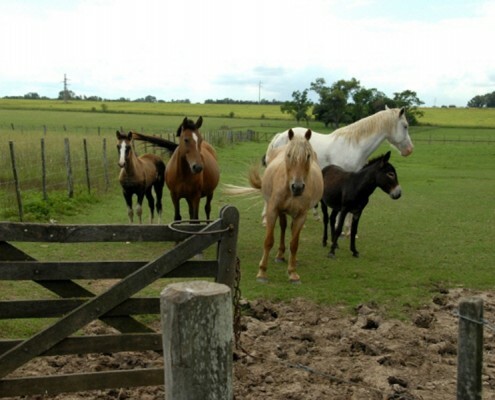 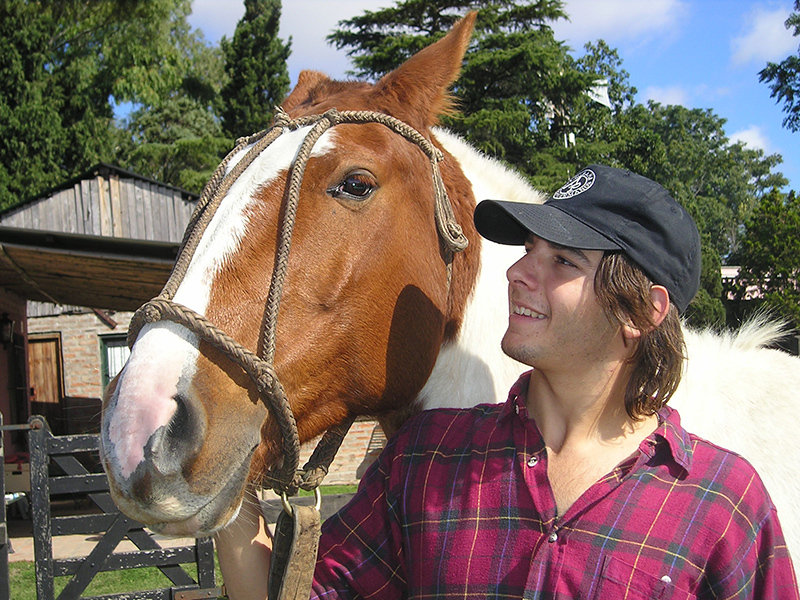 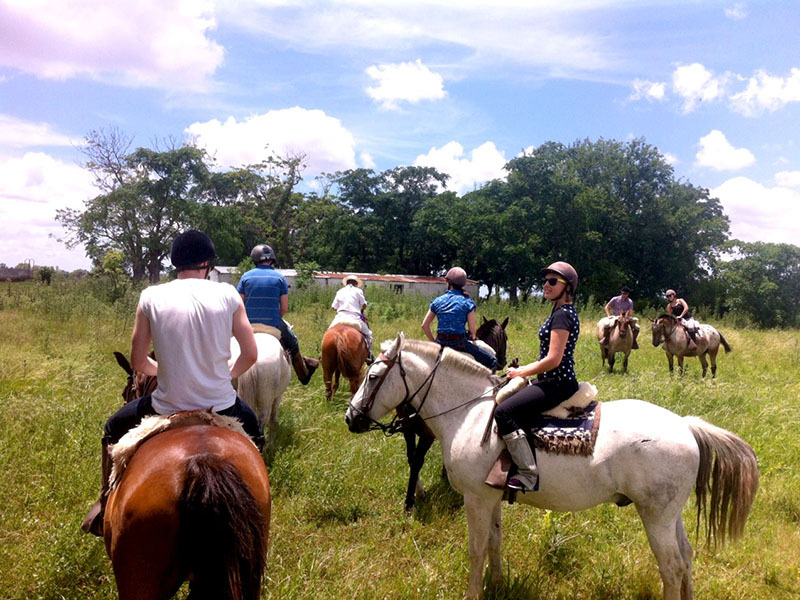 We have very calm horses for beginners, so everyone can learn how to ride. 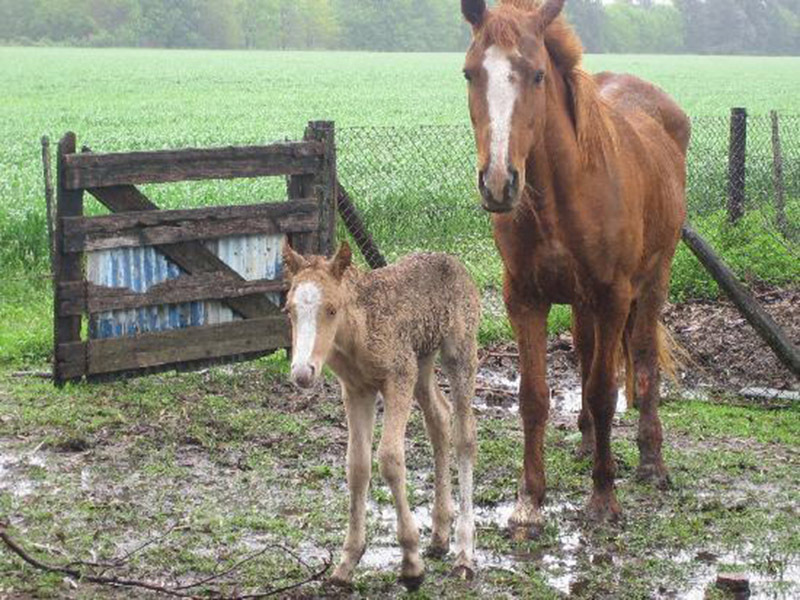 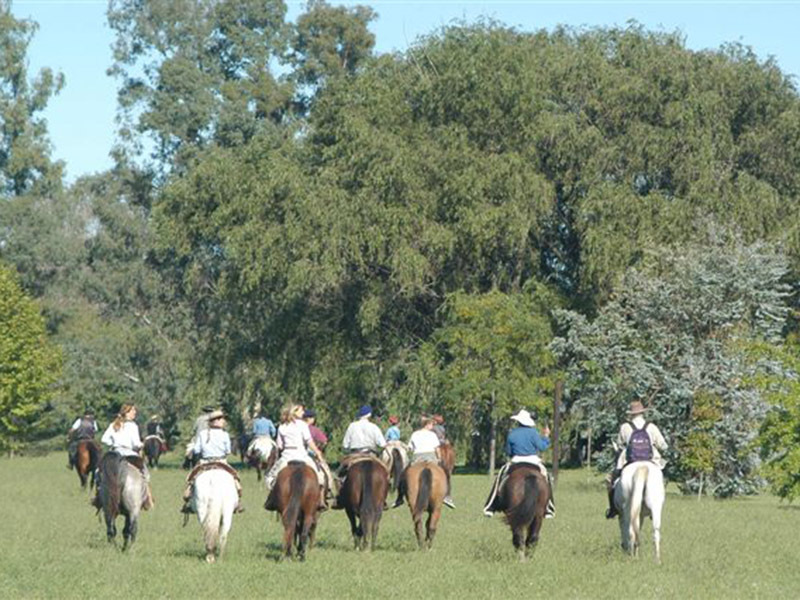 We teach you how to do it in case you need it, and there are also many horses for medium and for experienced riders too. 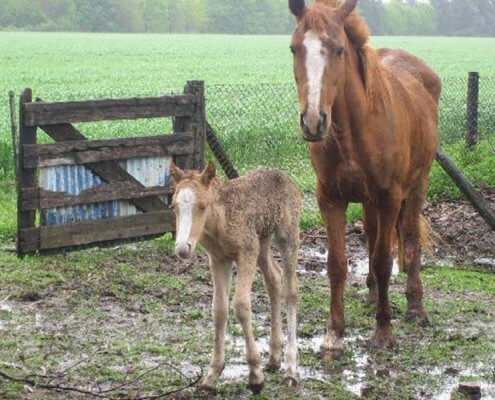 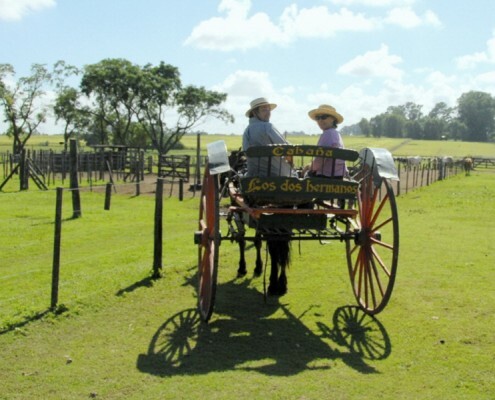 For those who prefer not to ride there is a swimming pool or you can walk around looking different types of birds, we have two sulkies available and two carriages. 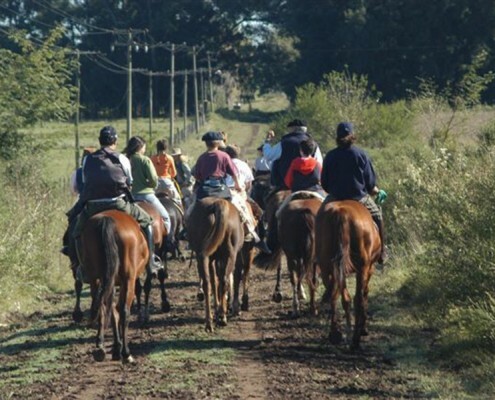 While we have coffee, mate, fruit juices, tea, mate cocido, croissants and cakes, the group gets acquired and prepares to share an adventure together. 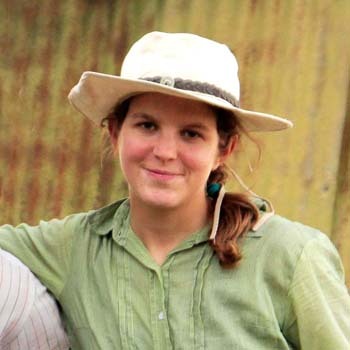 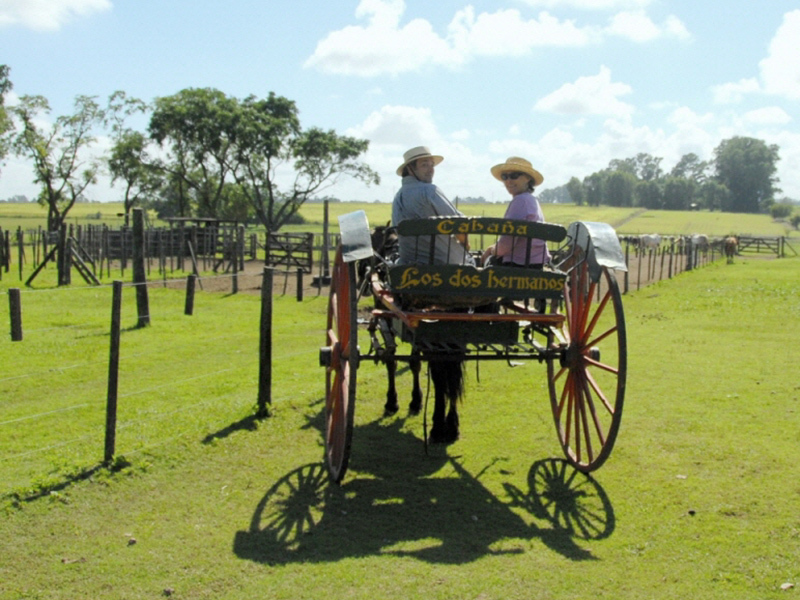 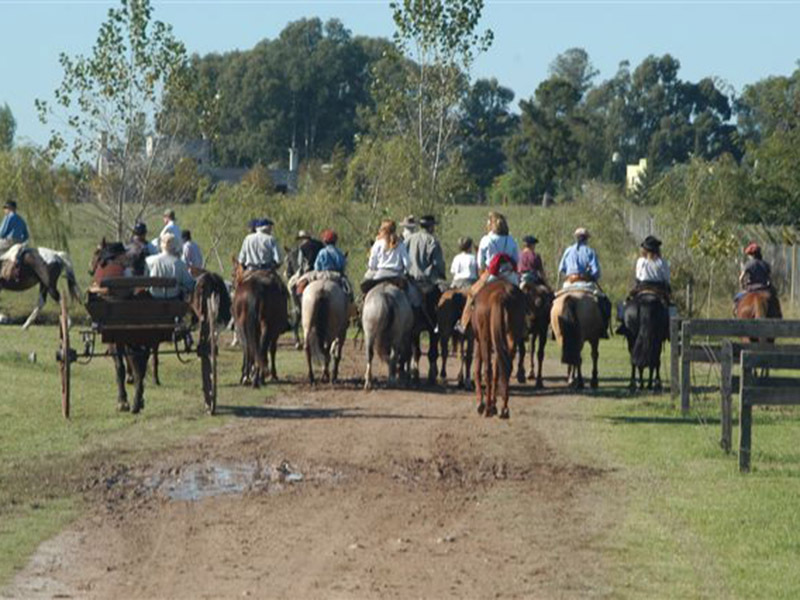 We ride all inside the farm, covering all the surroundings for about two hours, just walking, trotting and galloping, always with one or two guides according to the number of participants. 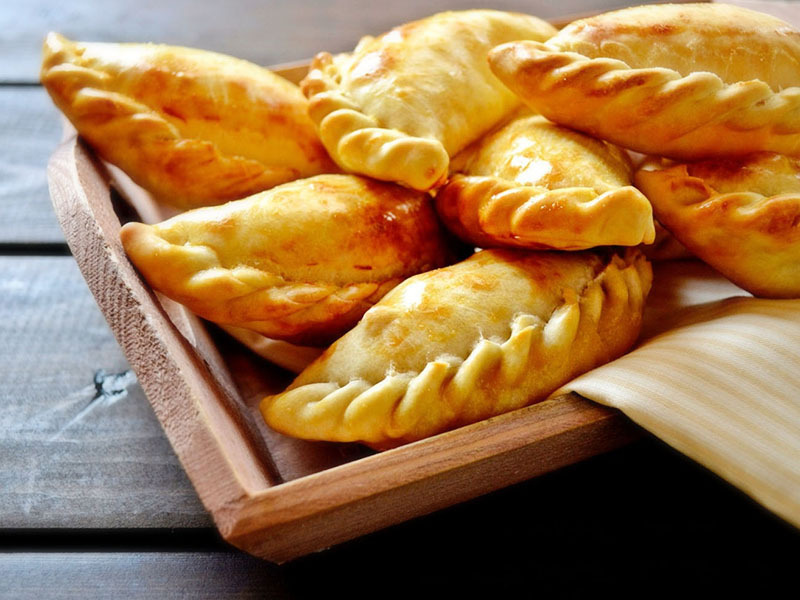 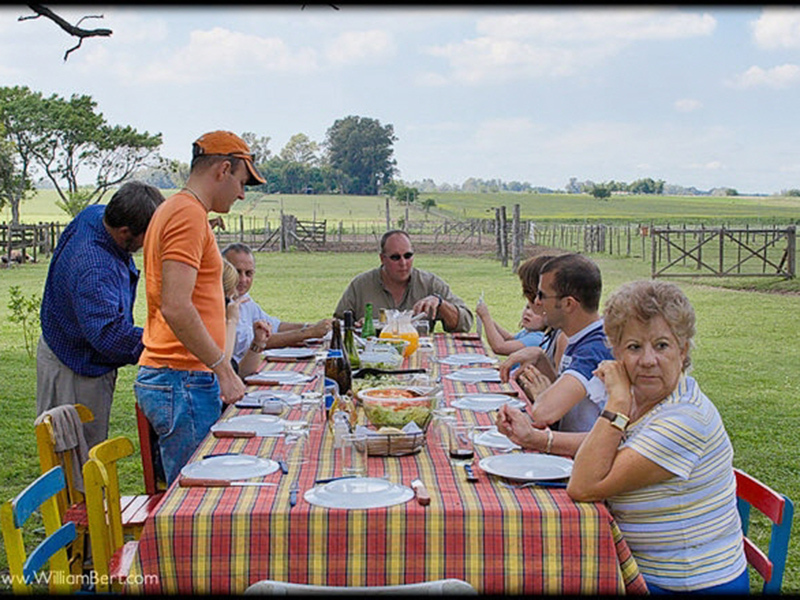 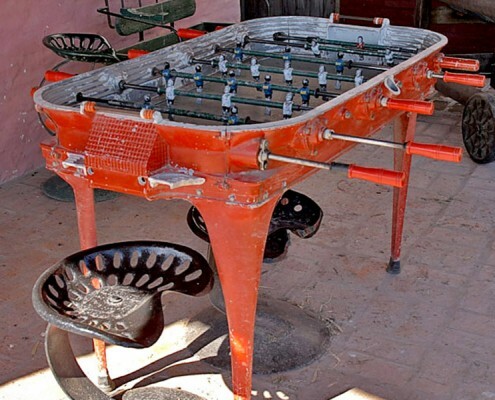 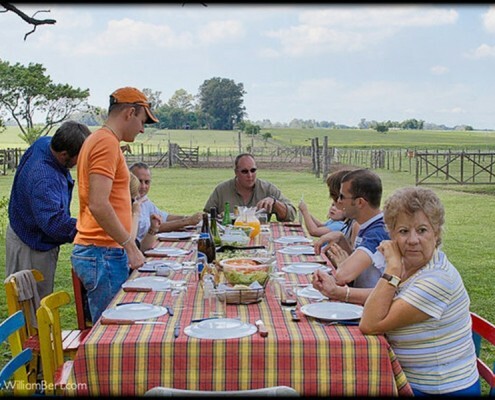 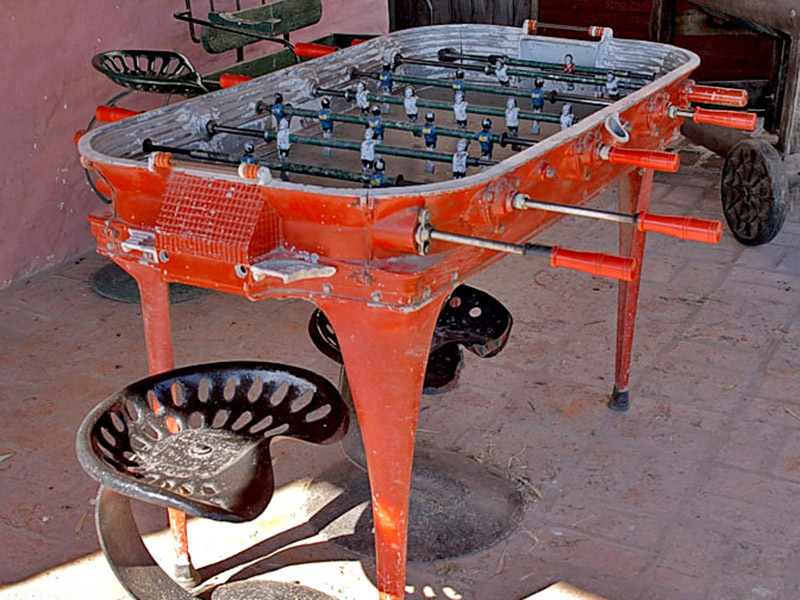 Then we arrive to the main house again and have an appetizer with “home made empanadas”, cold beer or a red wine. 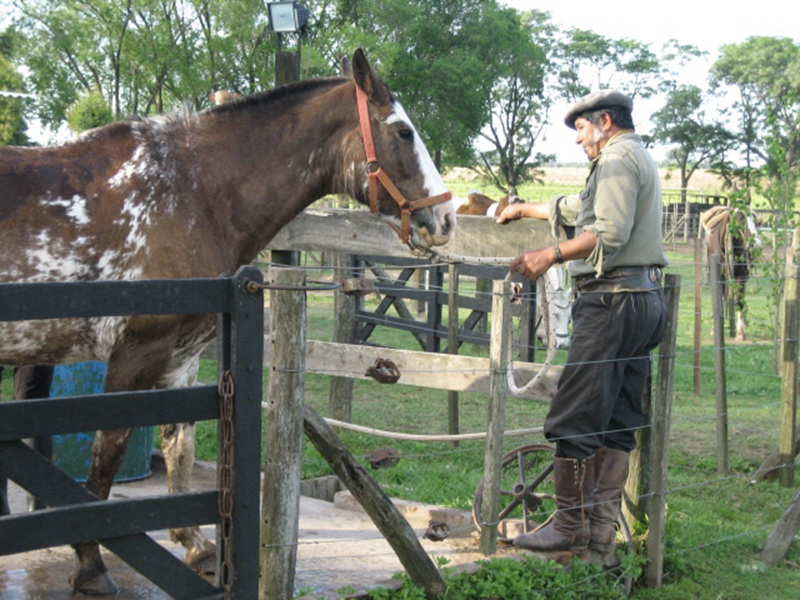 Then we let our horses rest and drink water very near the watermill. 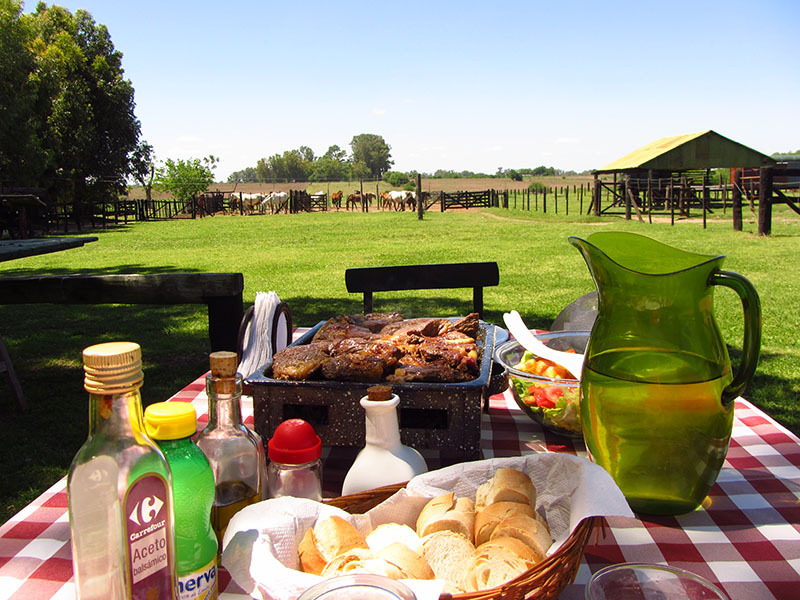 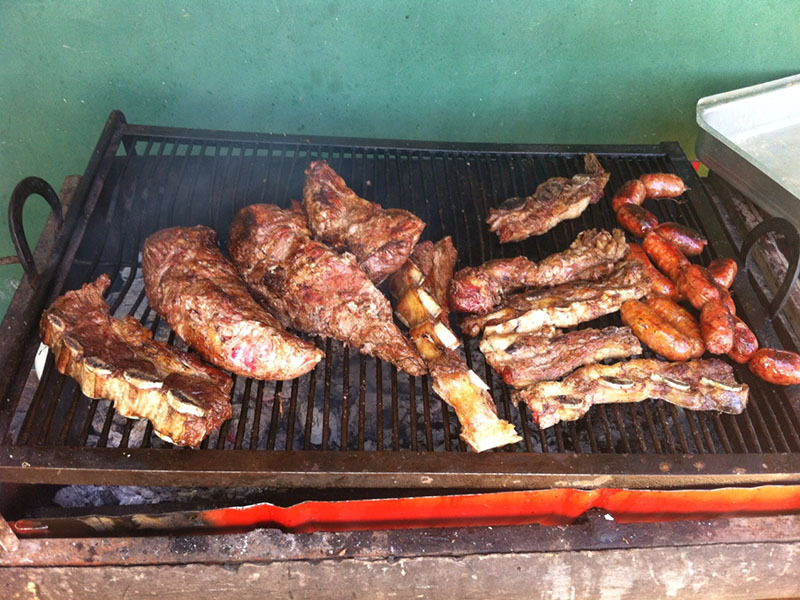 Meanwhile the smell for the barbecue indicates that there is a delicious “asado” waiting for us with sausages, different types of meat, “lomo”, salads, red wine, soft drinks, fruit and juices. 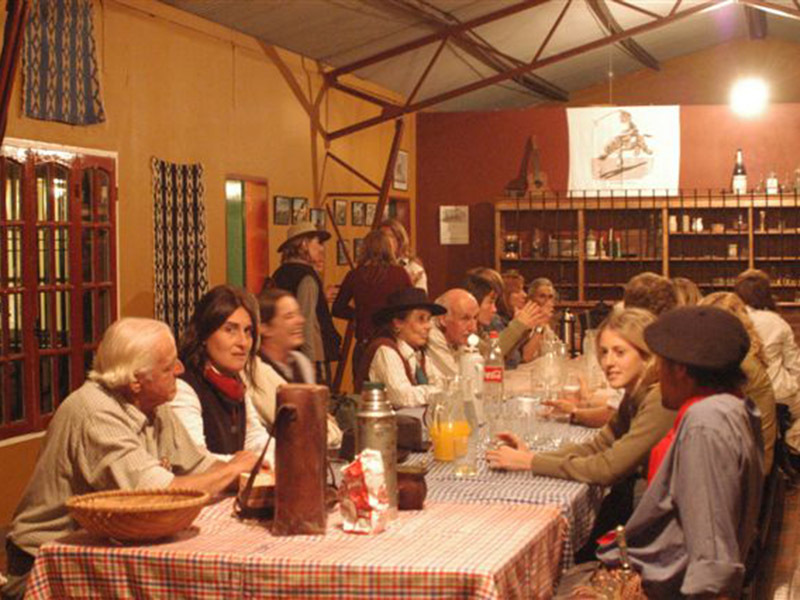 For dessert, pudding and coffee is served. 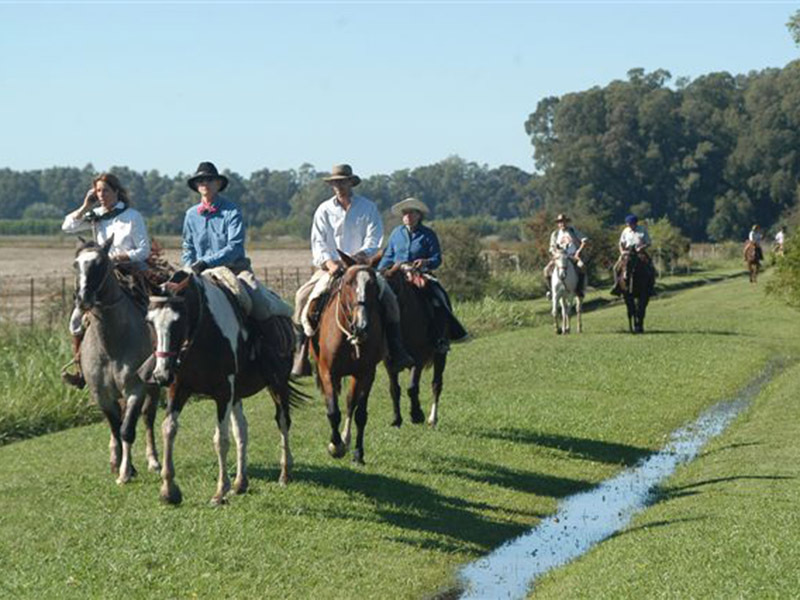 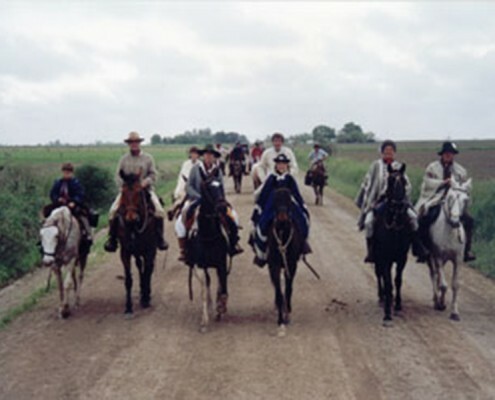 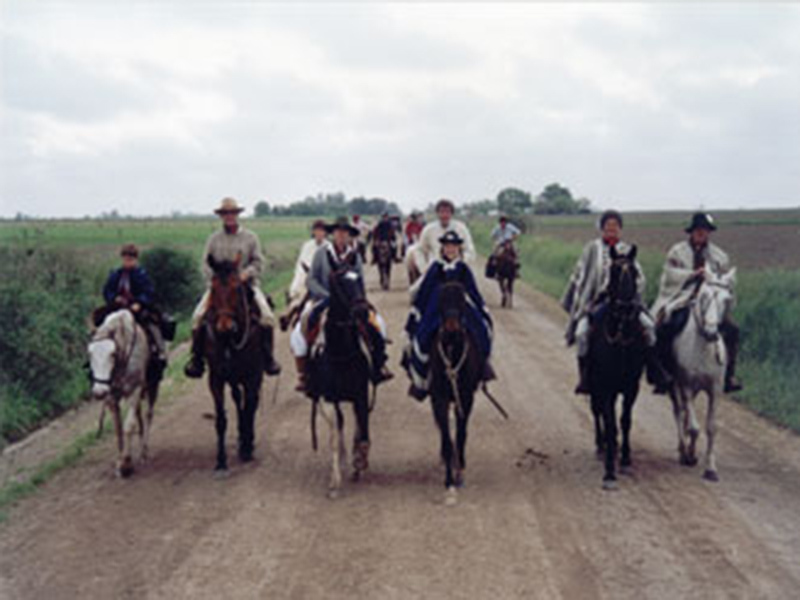 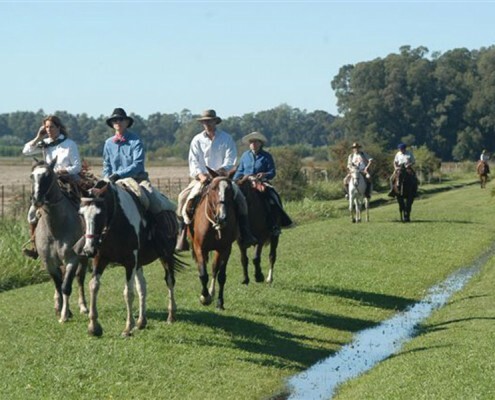 After lunch we mount again and take another direction outside the “Estancia los dos hermanos” riding for about two hours, observing horse herds guarding the lagoon where cows, calfs, lapwings and colts are reflected in the water. 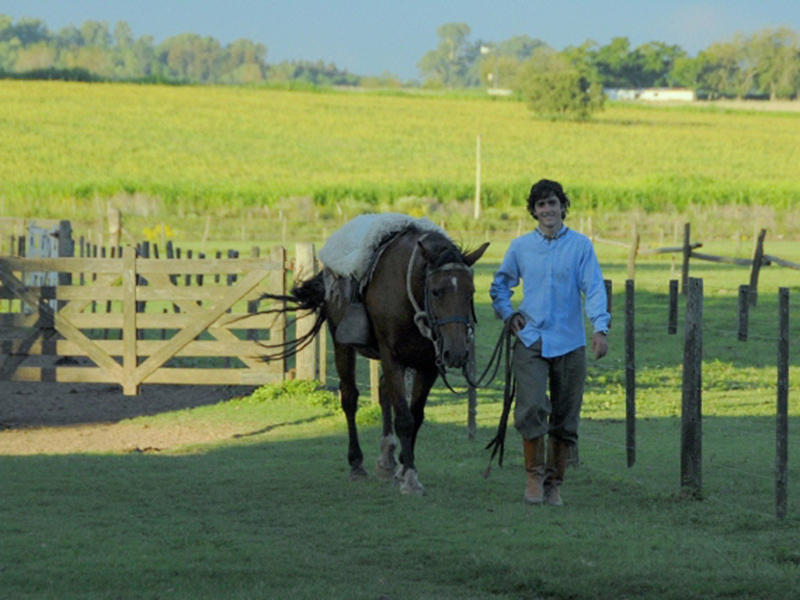 We say goodbye to each of our horses and are ready for a well deserved tea. 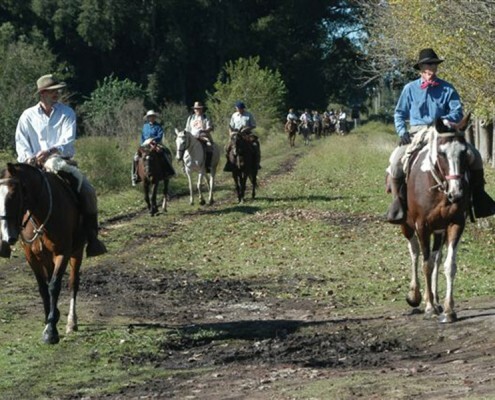 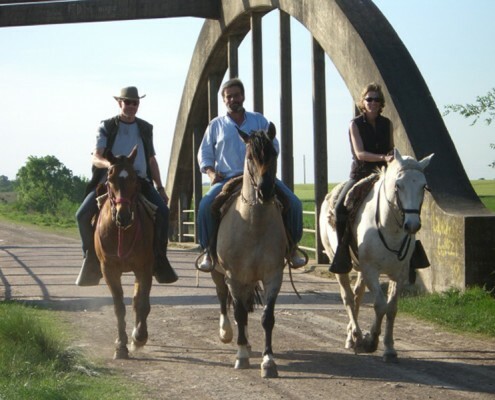 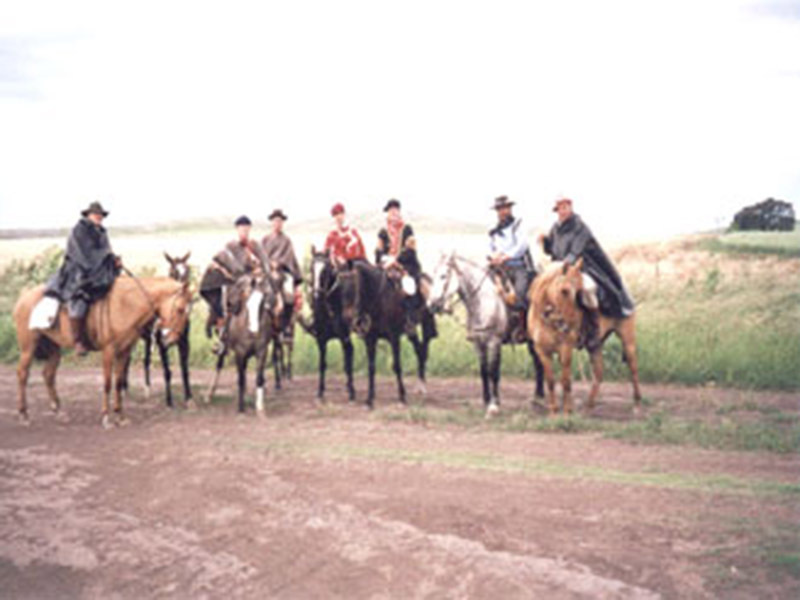 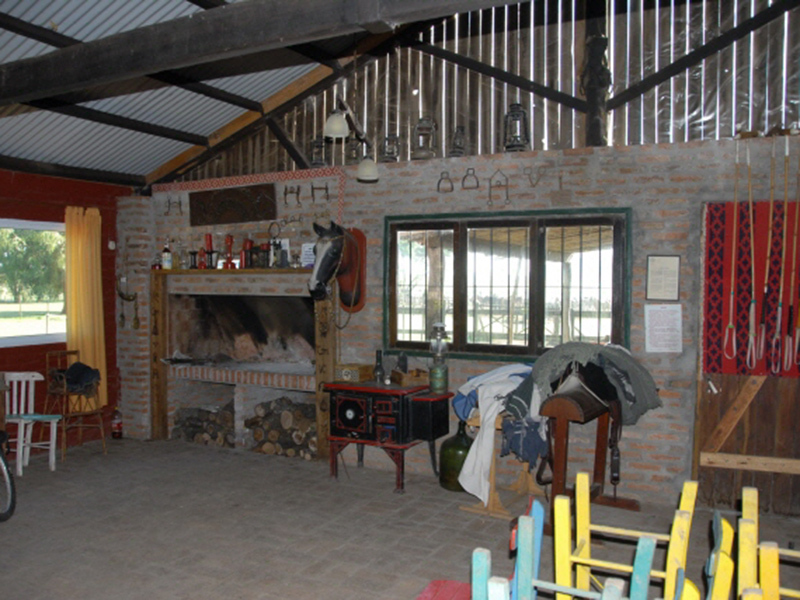 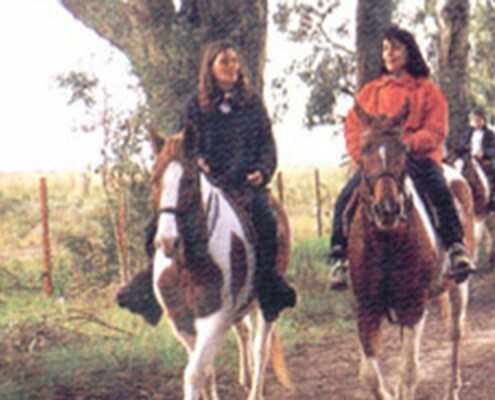 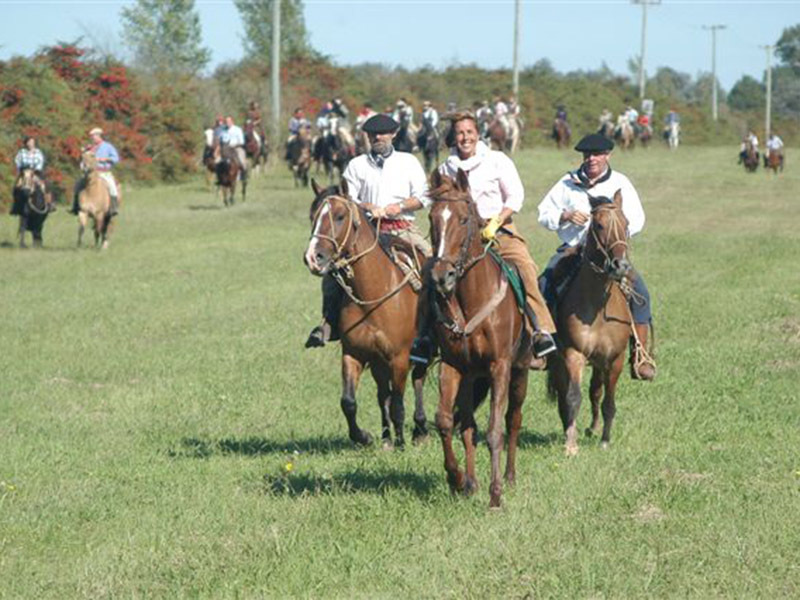 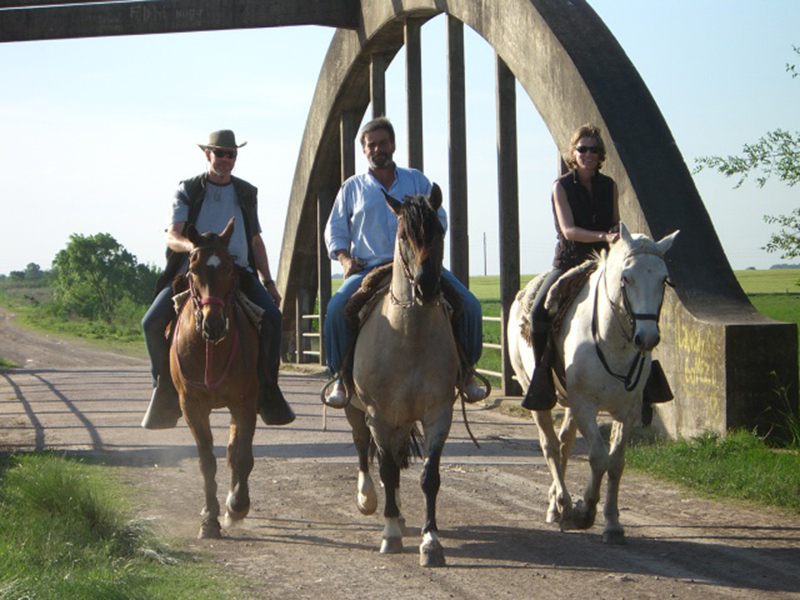 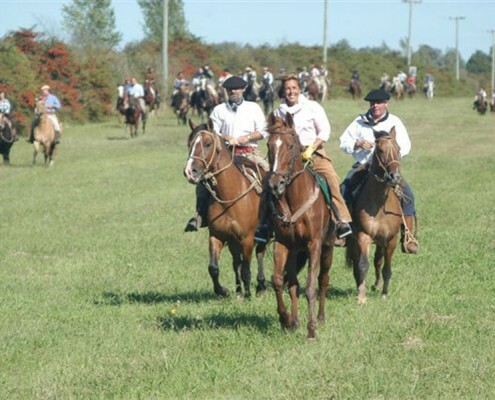 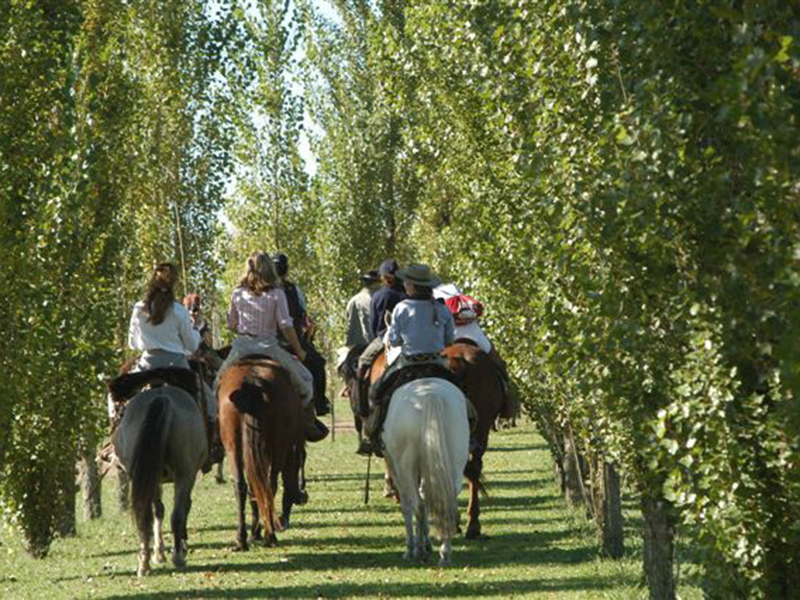 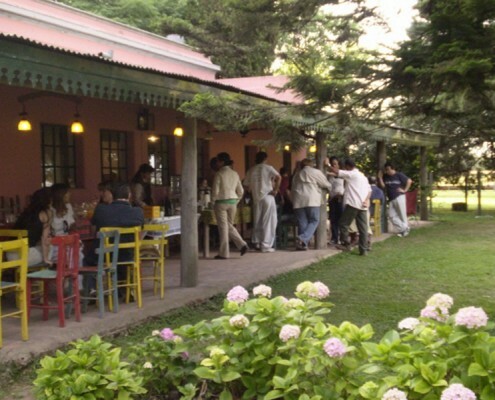 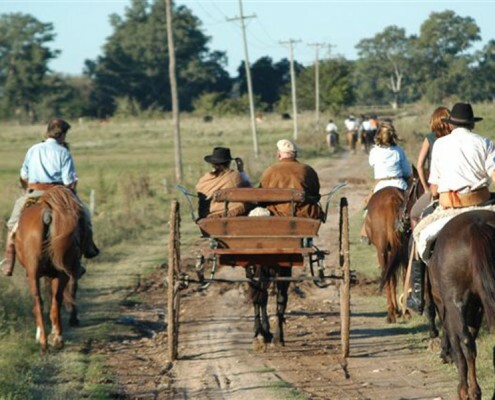 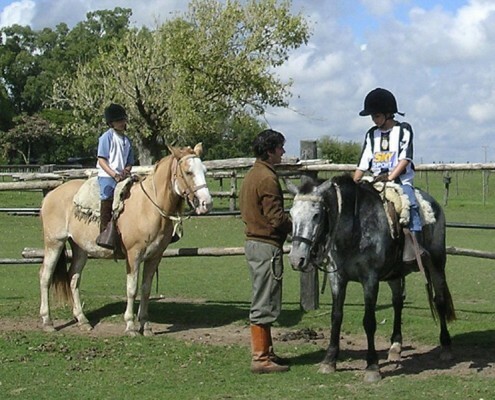 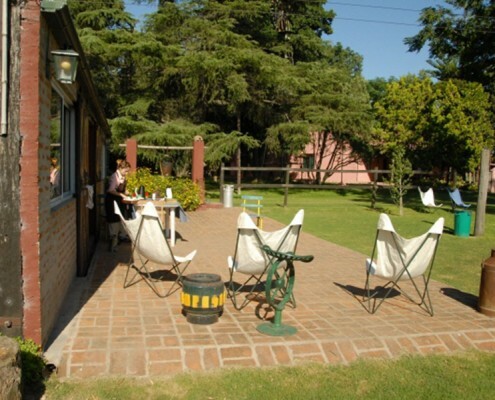 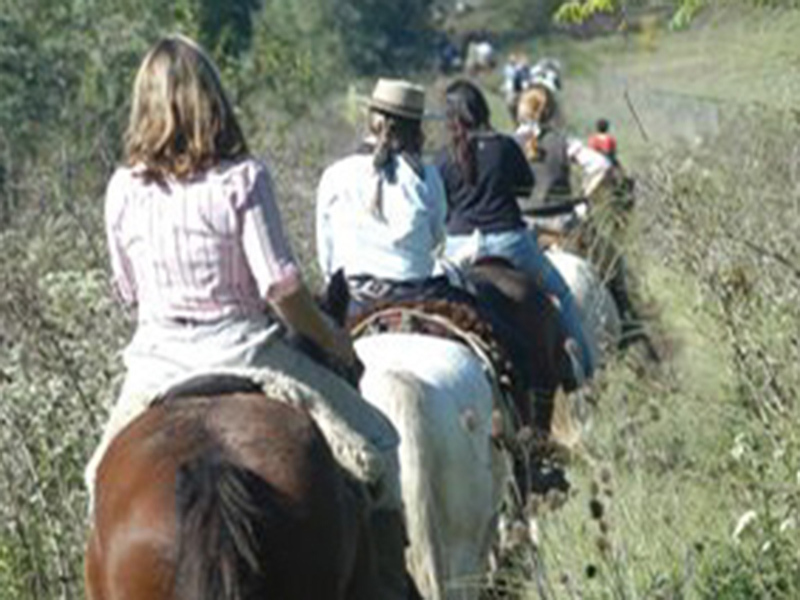 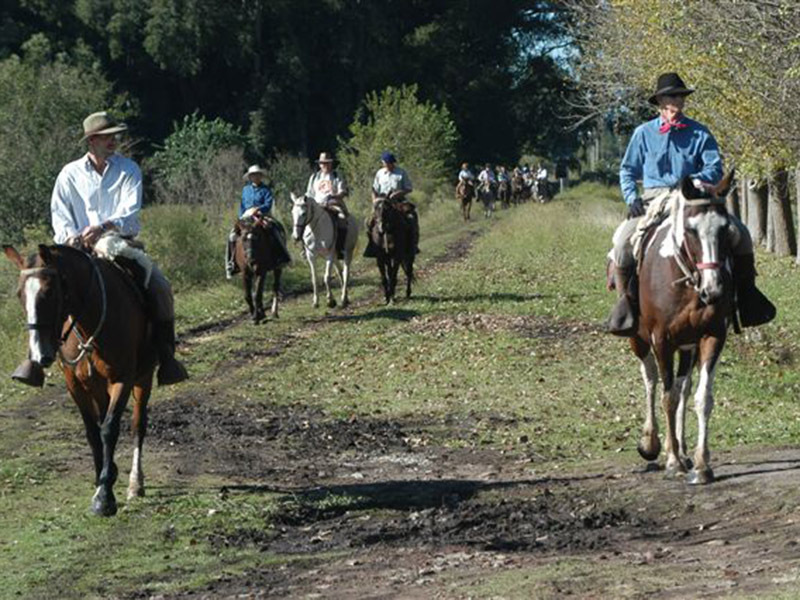 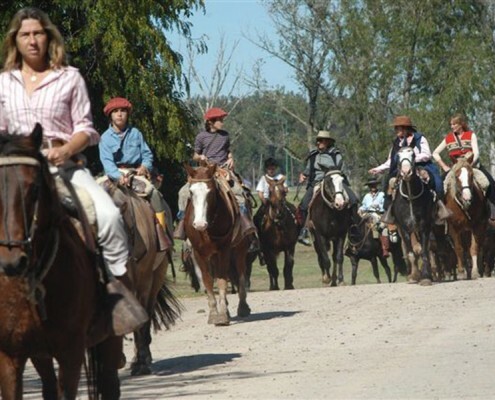 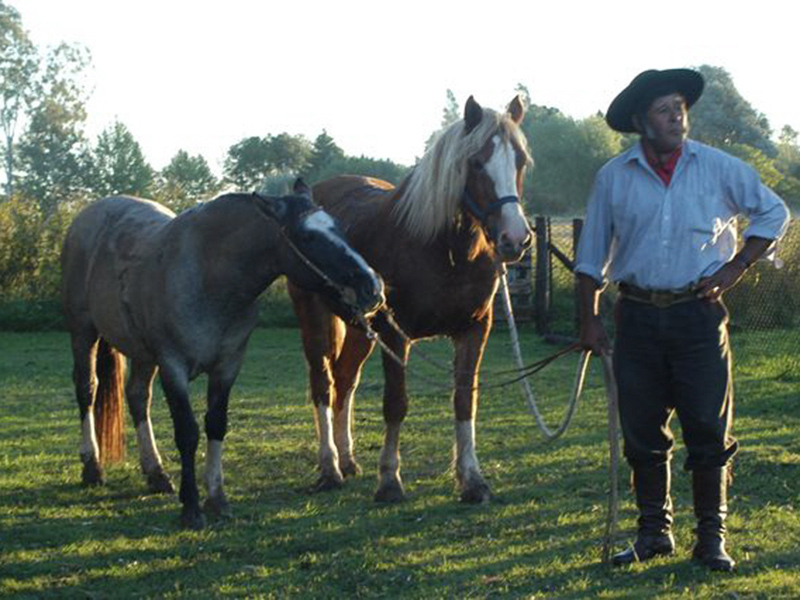 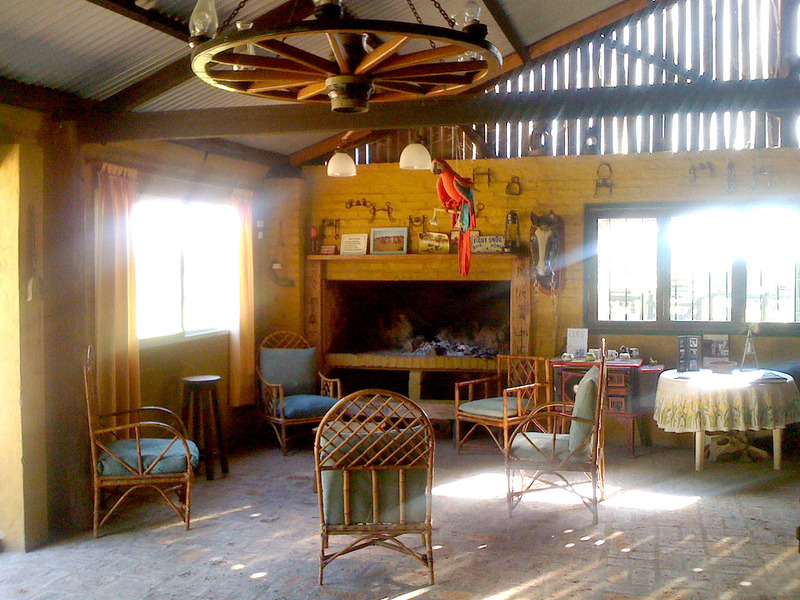 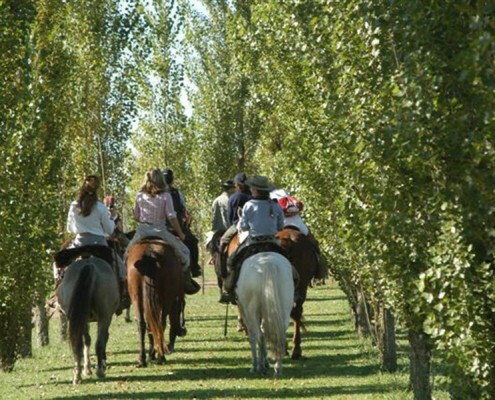 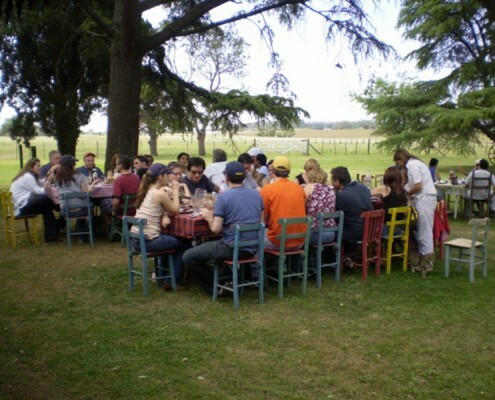 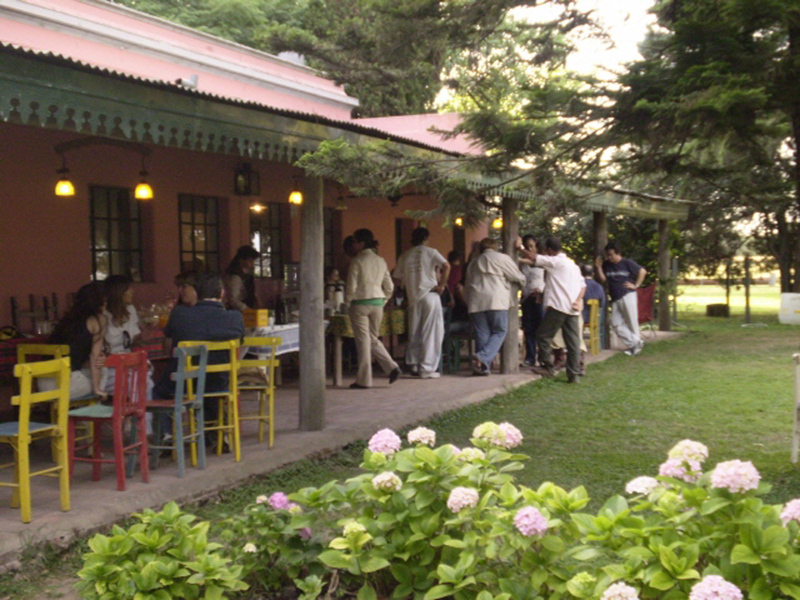 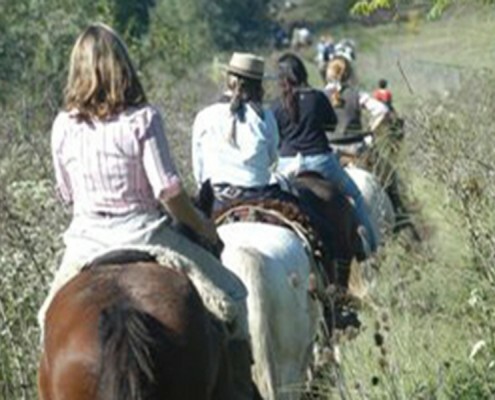 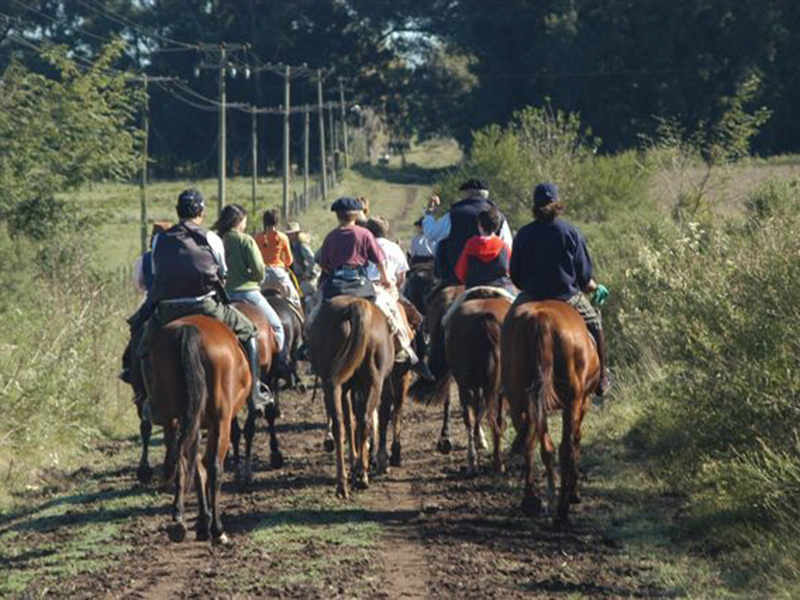 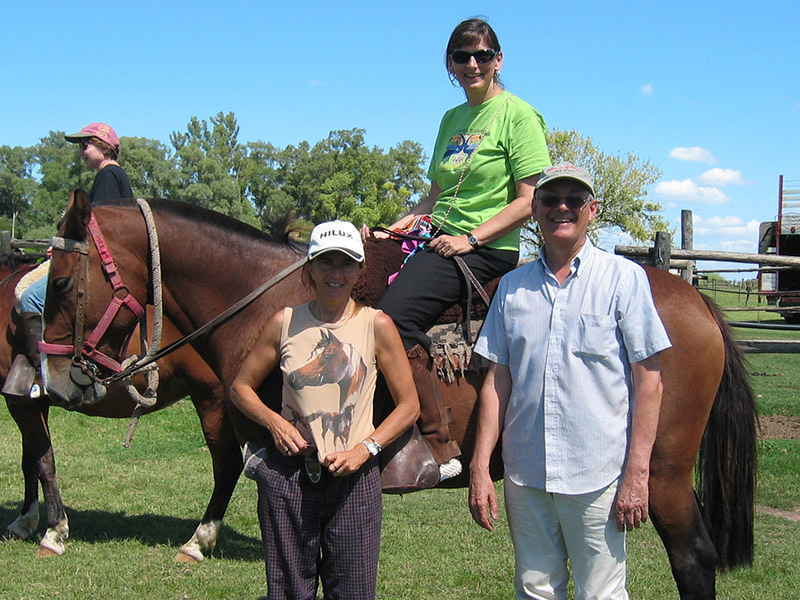 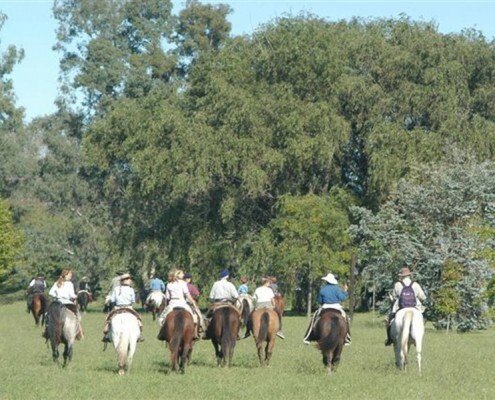 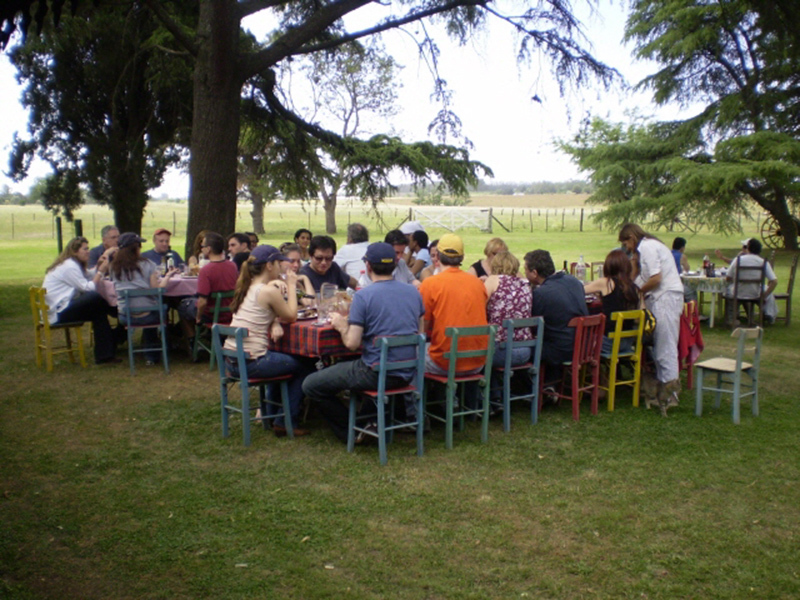 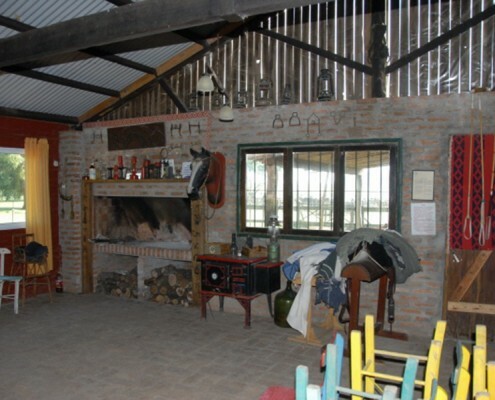 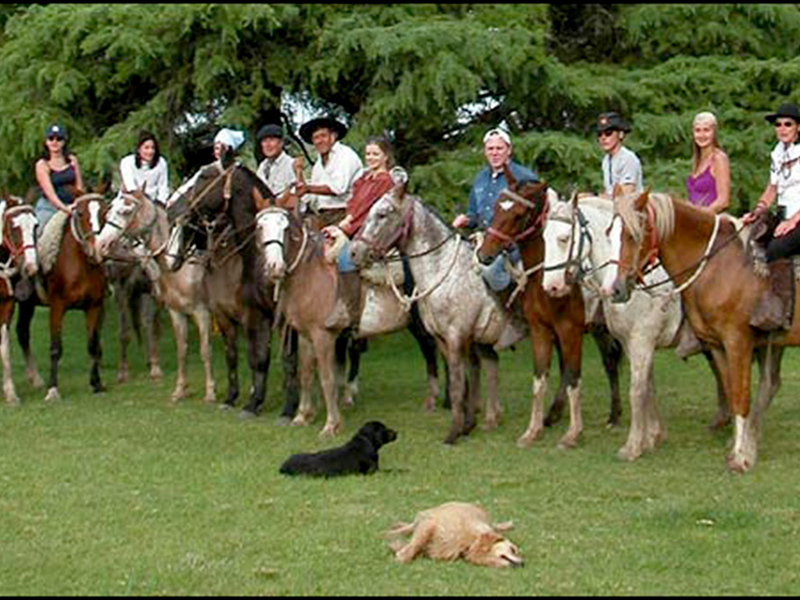 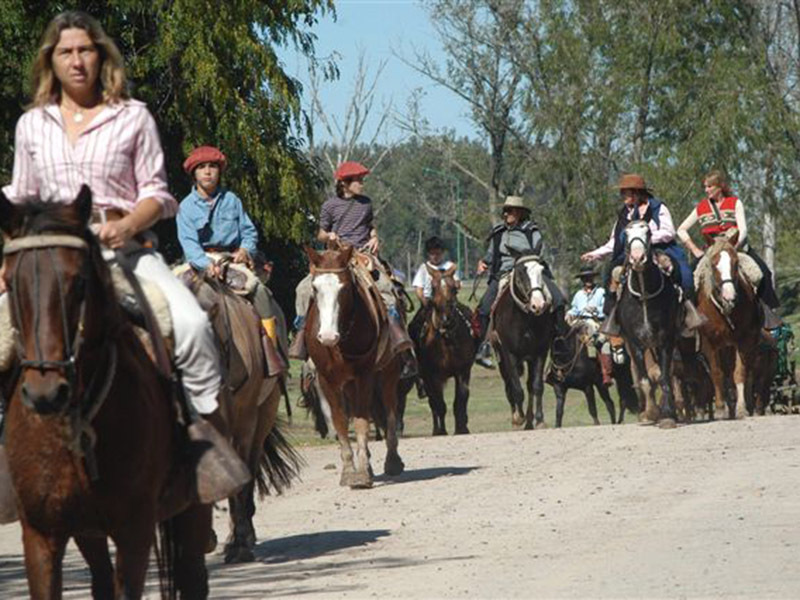 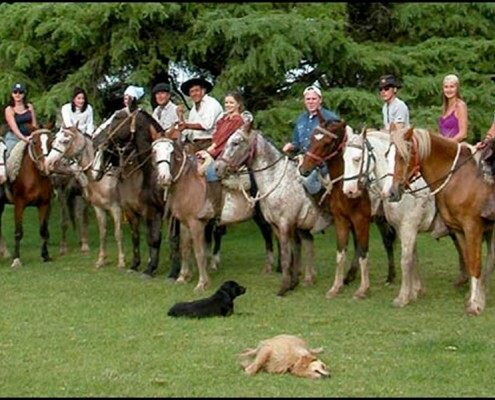 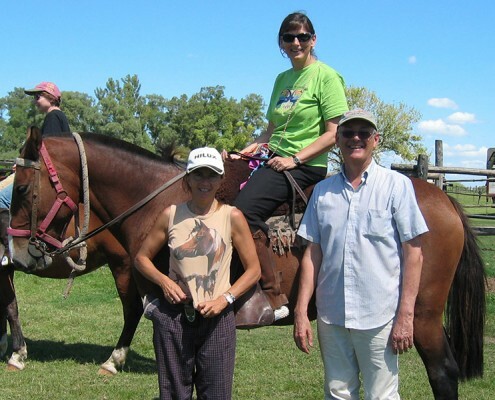 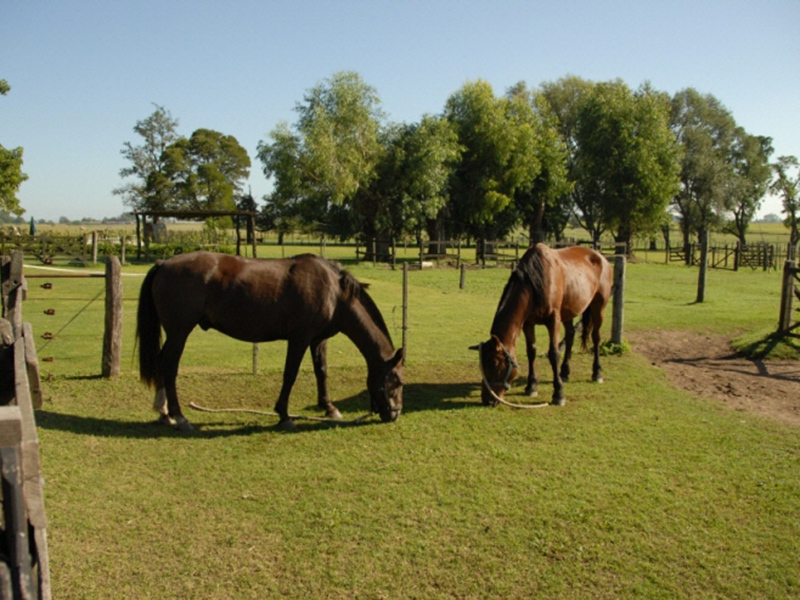 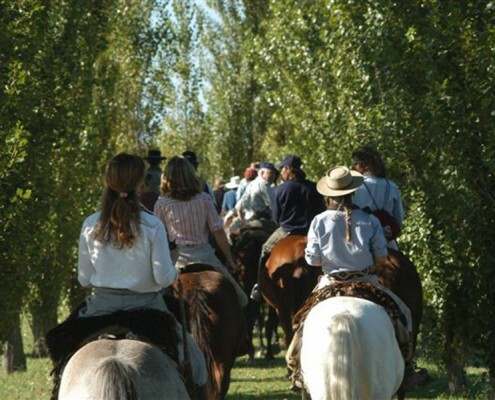 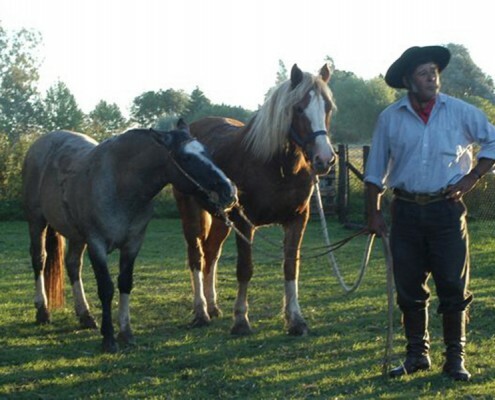 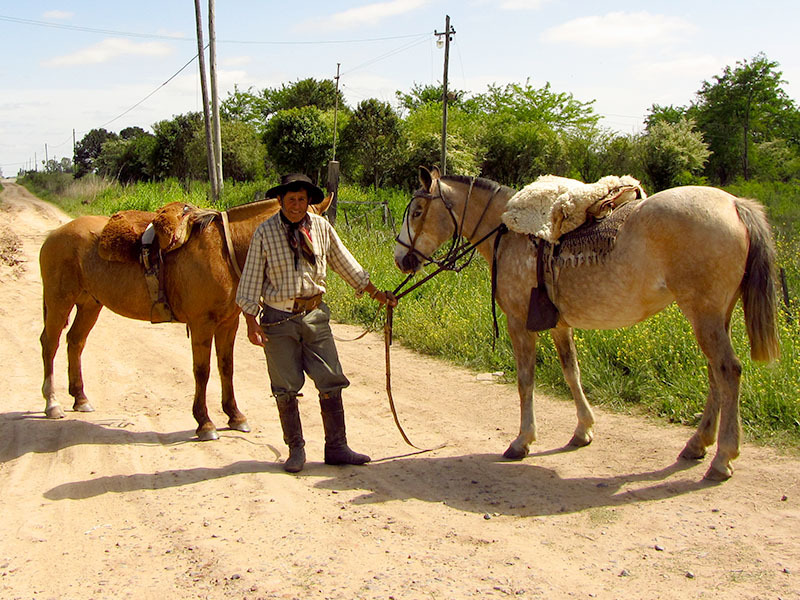 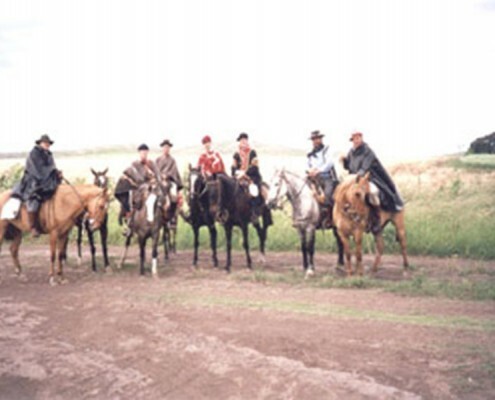 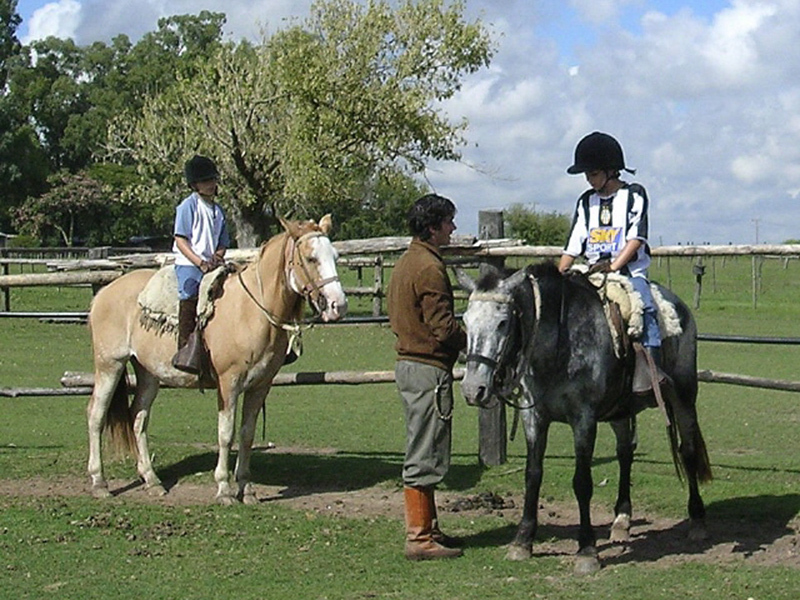 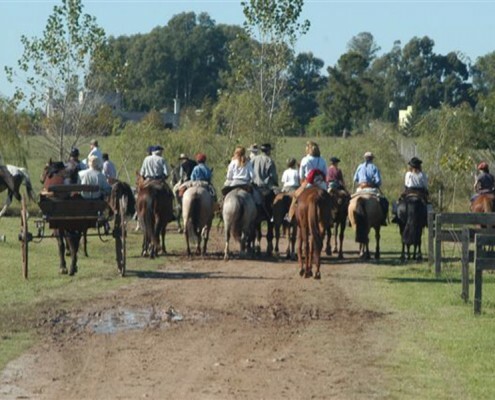 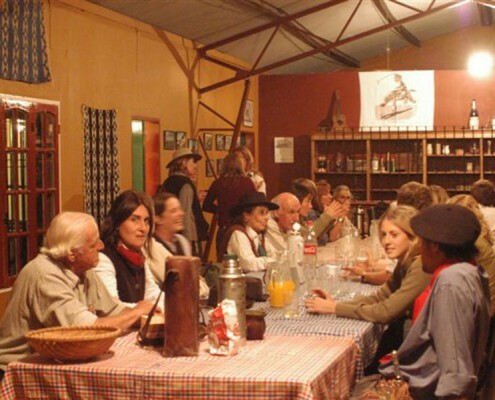 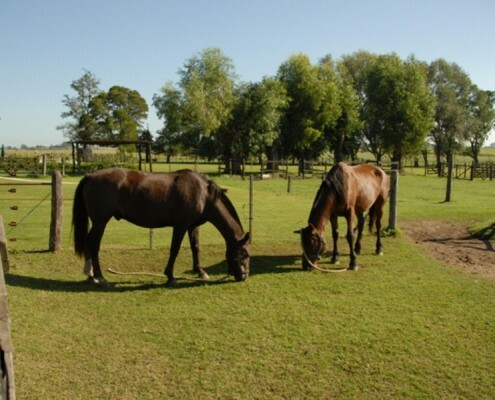 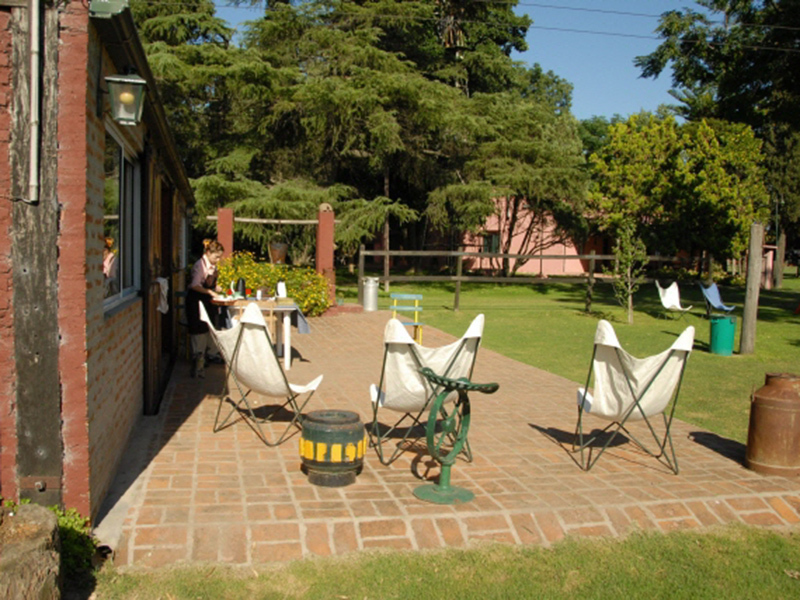 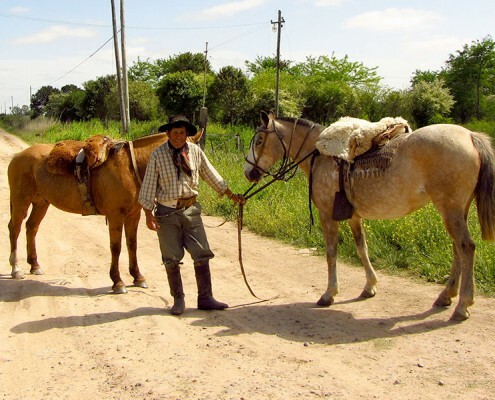 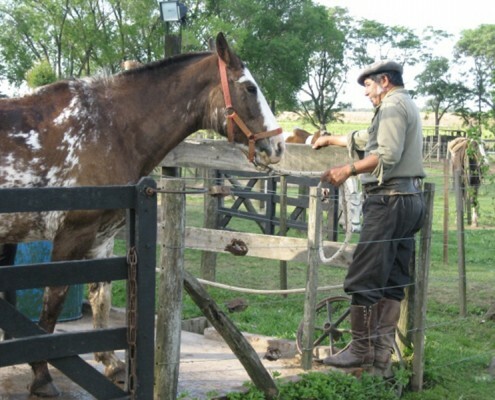 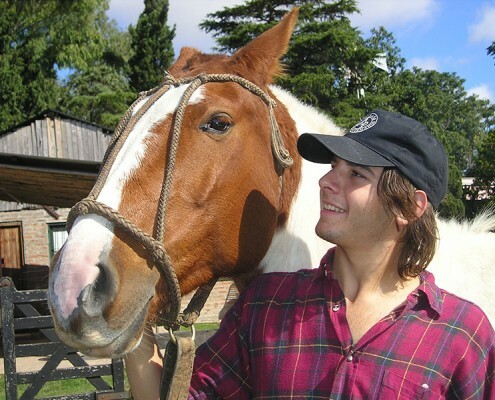 The “tortas fritas”, “buñuelos”, soda drinks, mate, fruit juices, a very cold beer, tea and coffee that are served, also help to interchange the lively experiences lived during the horseback riding. 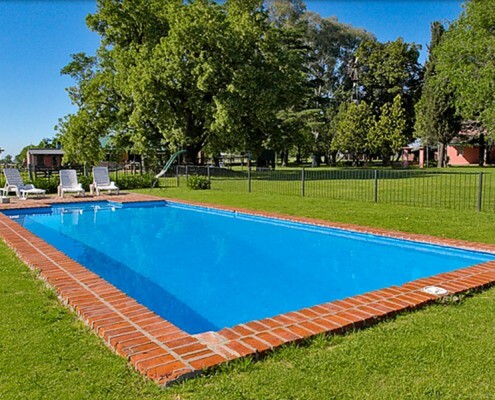 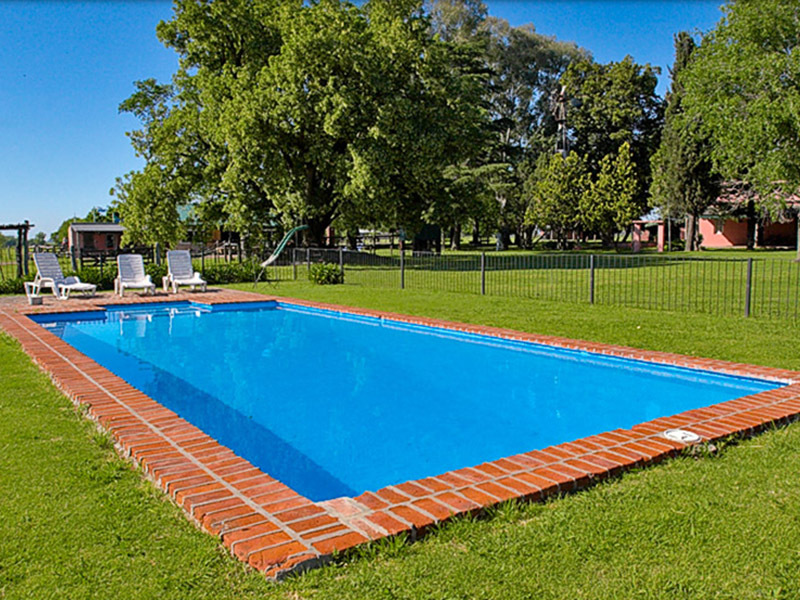 We have a swimming pool for those who prefer to sunbathe or have a swim. 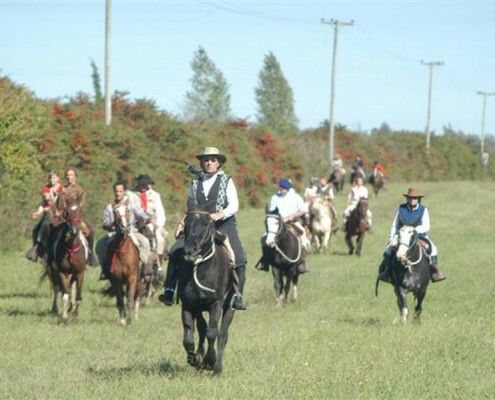 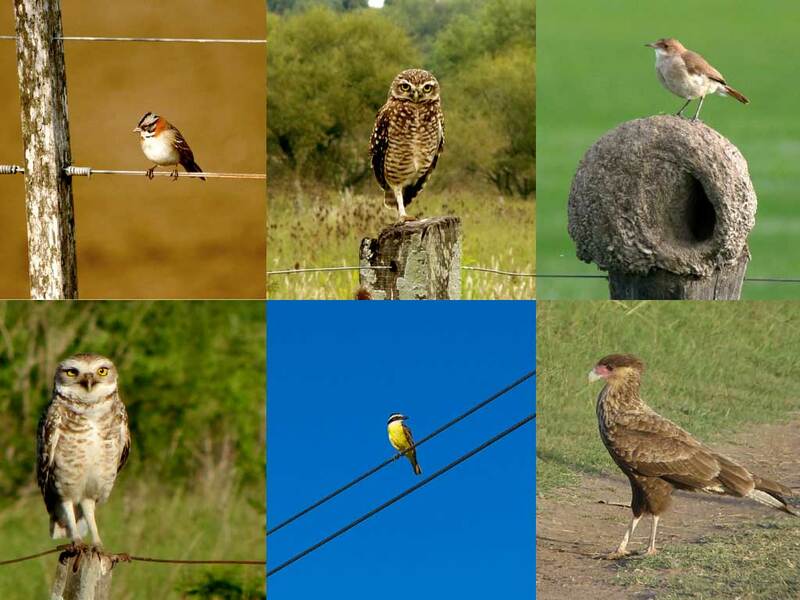 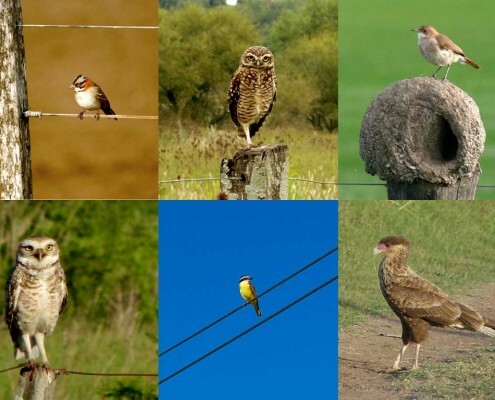 Everybody can participate in the ridings! 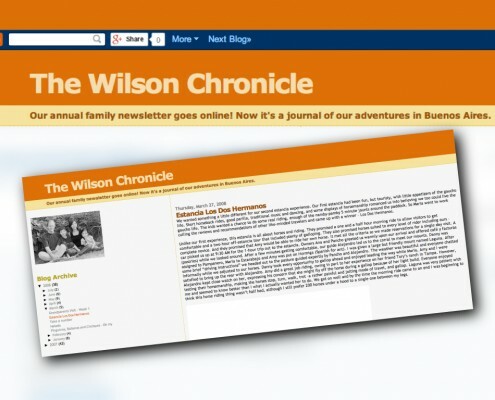 Adults, kids, boys, girls, everyone! 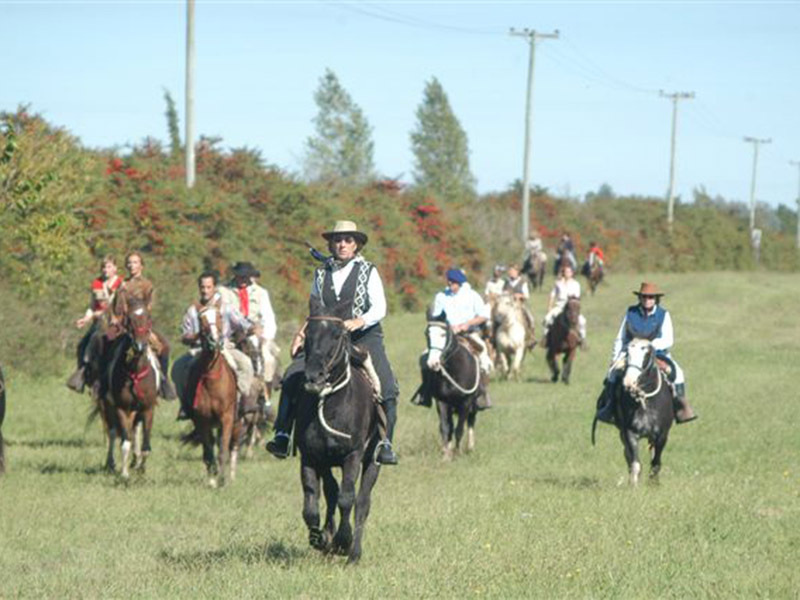 It´s important that everyone should participate, have fun and have the opportunity to experience our traditions. 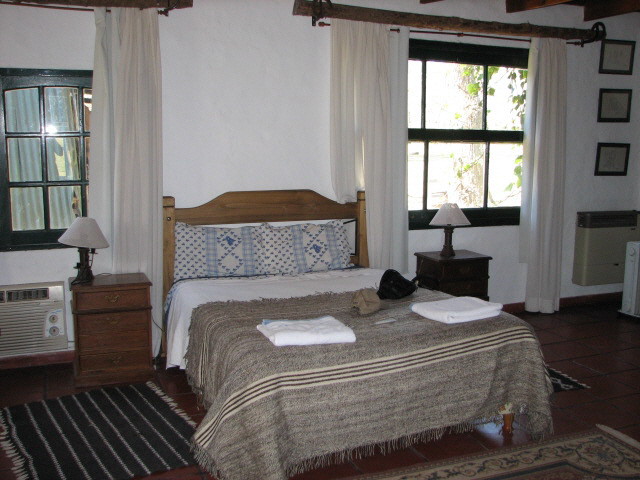 Exclusivity, maid service, double beds, bedding and towels, satelital TV, Wi-Fi, heating. 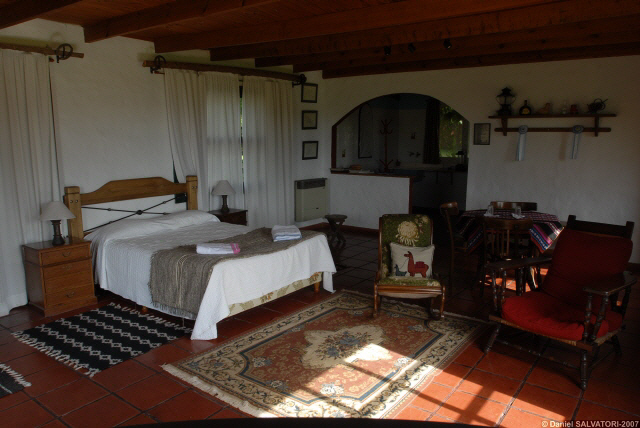 “LA ISOLINA”: Big cottage with living & dinning room, fully equipped for a couple with double bed, 3 bedrooms and two private bathrooms. 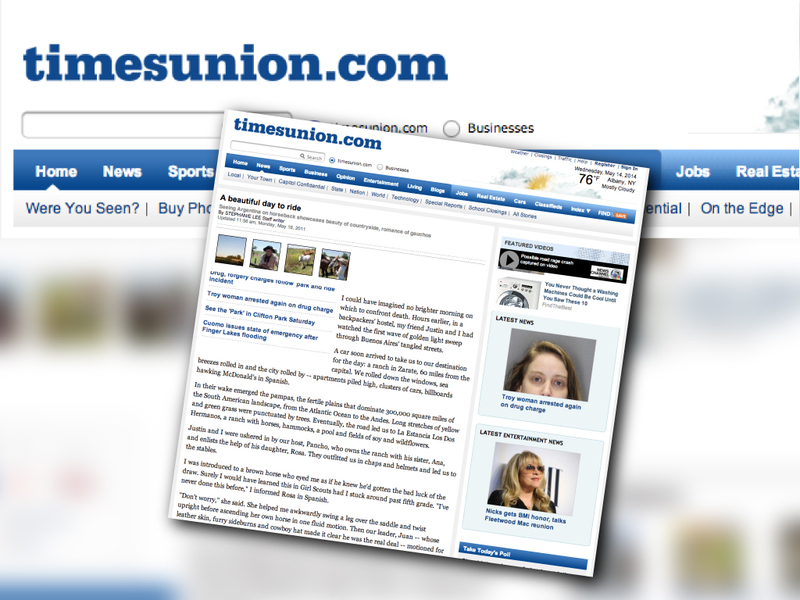 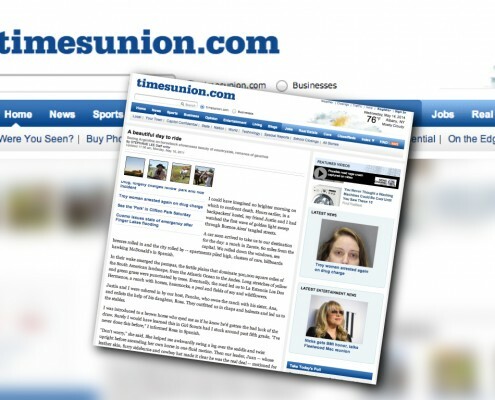 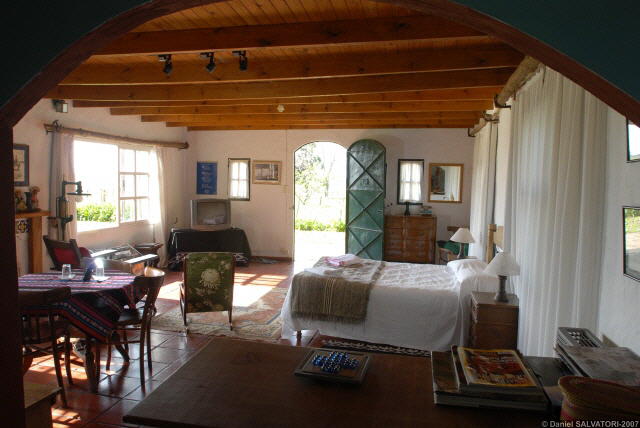 “LA UNION”: Small cottage with living, bedroom and private bathroom. 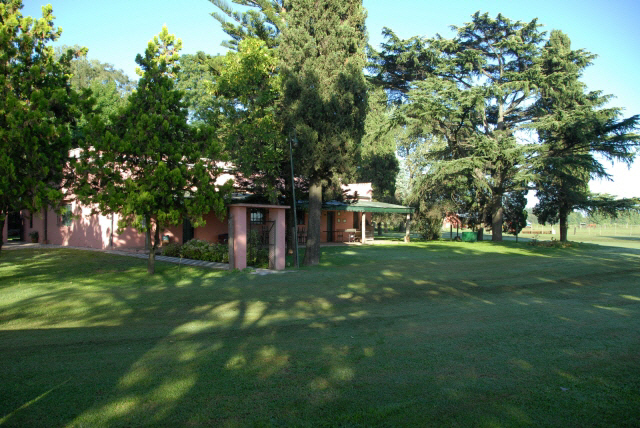 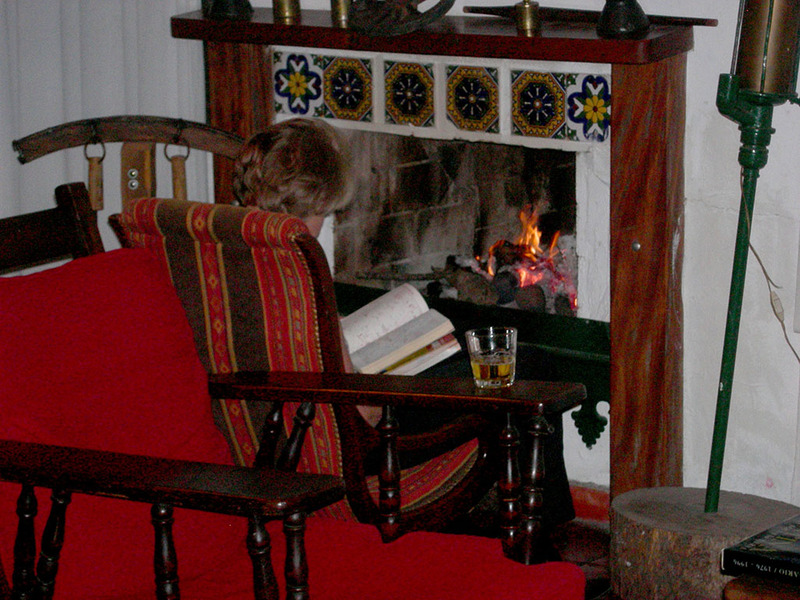 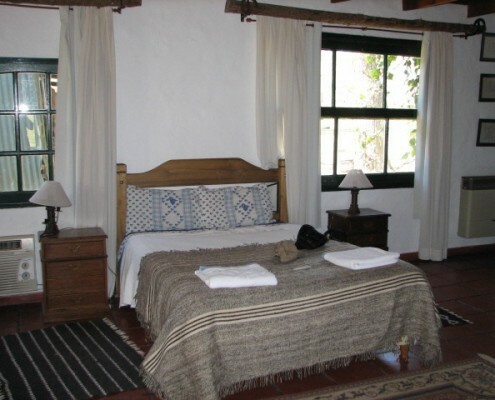 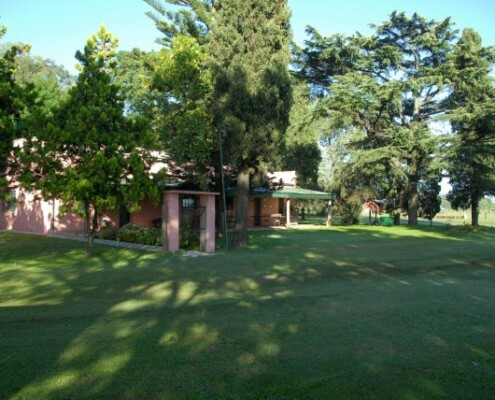 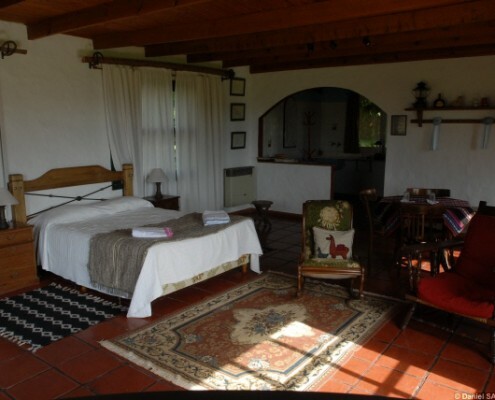 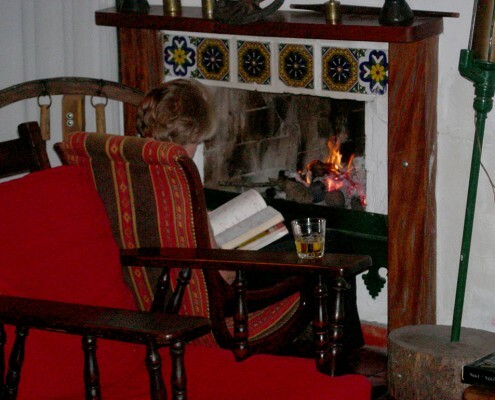 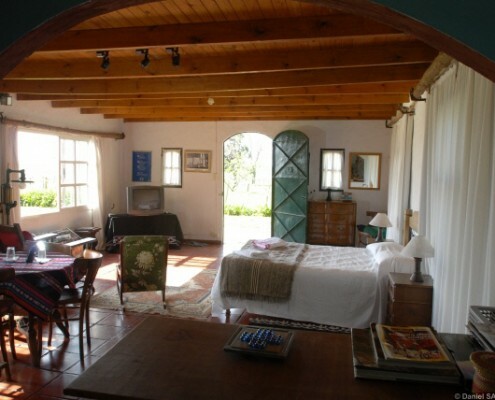 “LA CAPILLA”: Big cottage (loft) fully equipped for a couple, with fireplace and private bathroom. 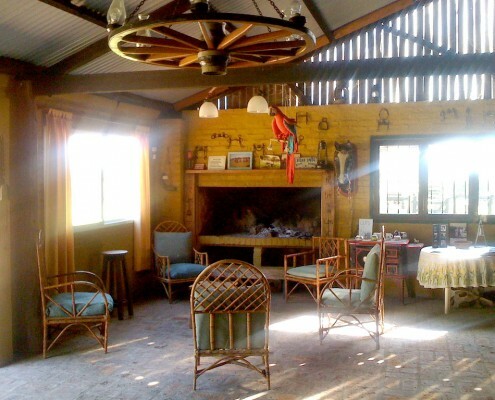 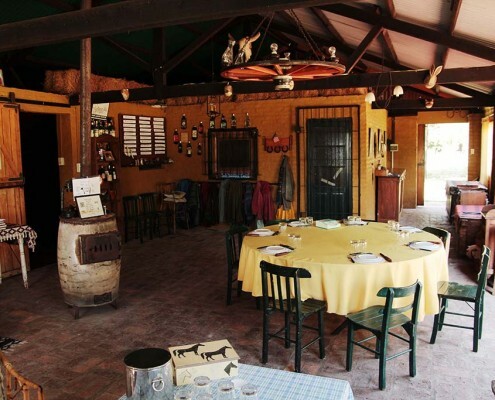 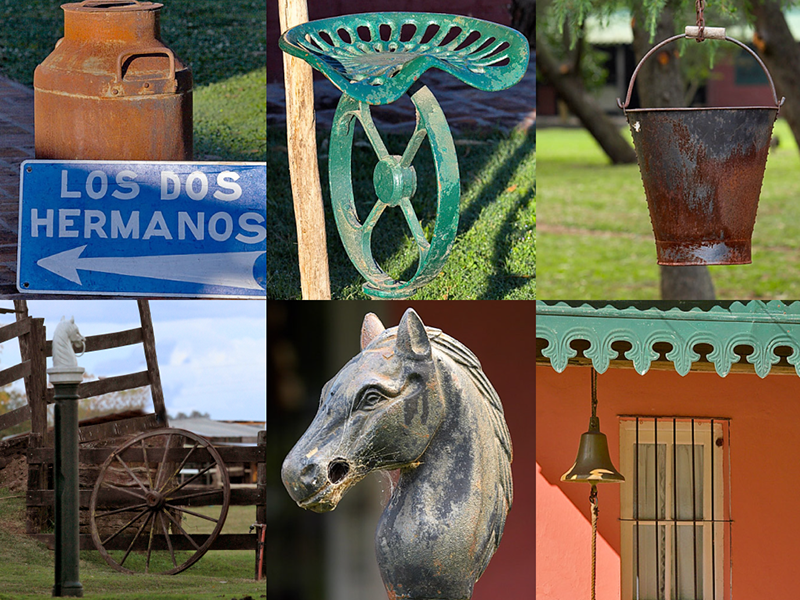 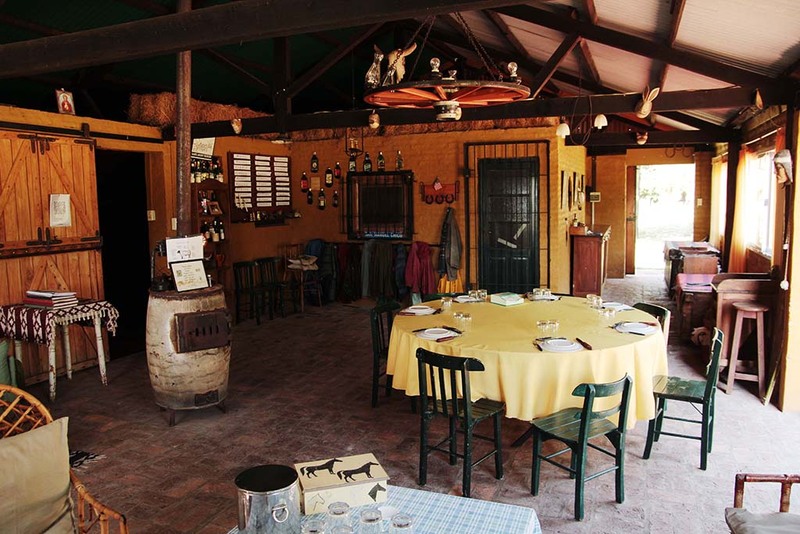 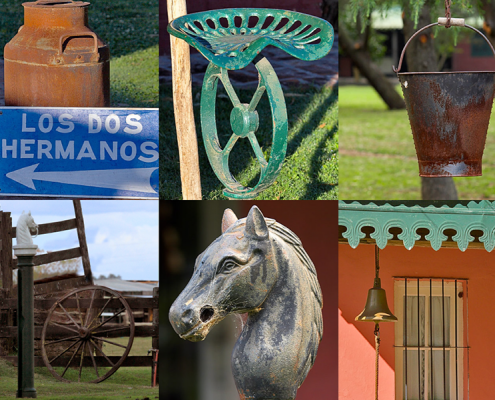 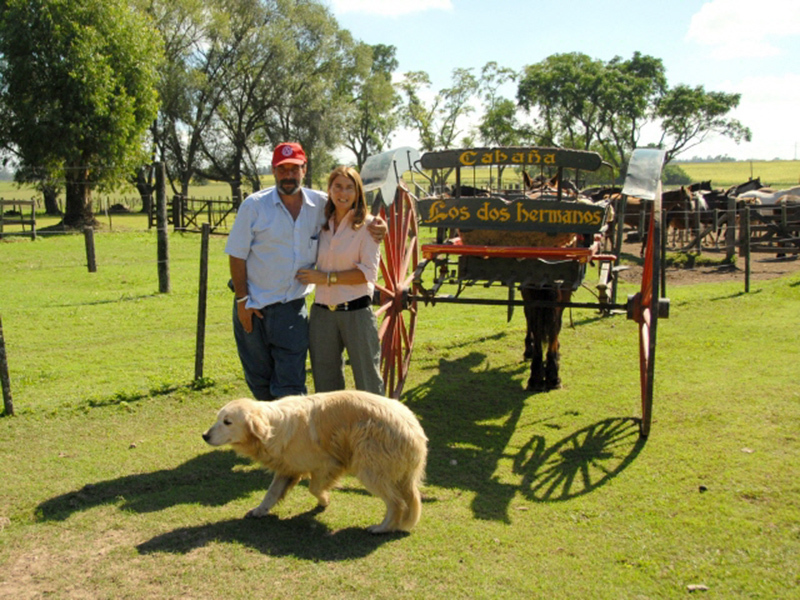 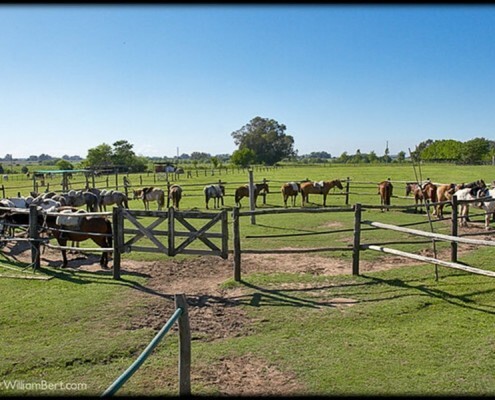 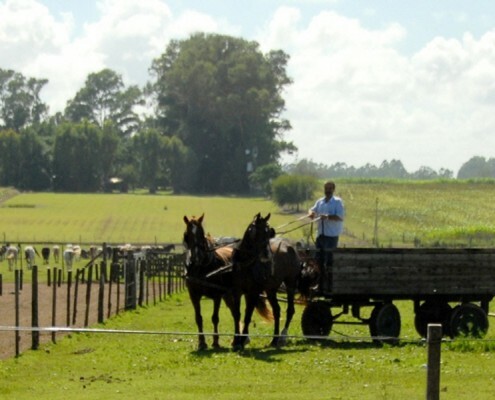 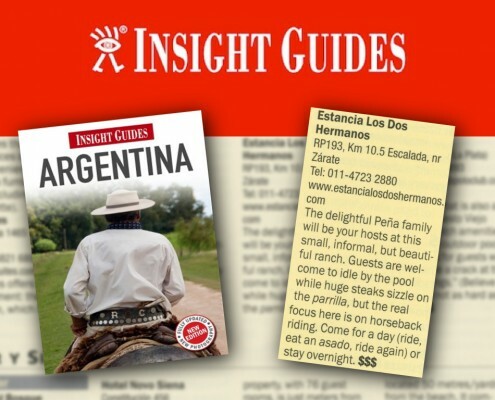 In this section we want to share the experiences and opinions of those visitors who visited “Estancia Los Dos Hermanos.” If you were at the farm, leave your opinions on TripAdvisor. 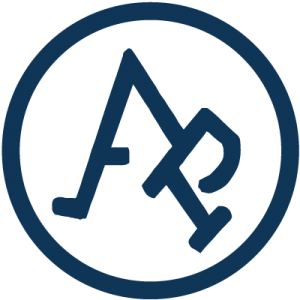 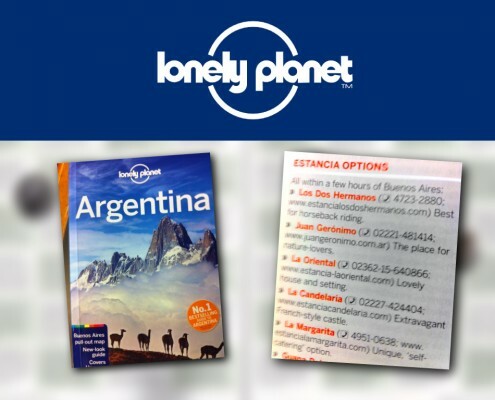 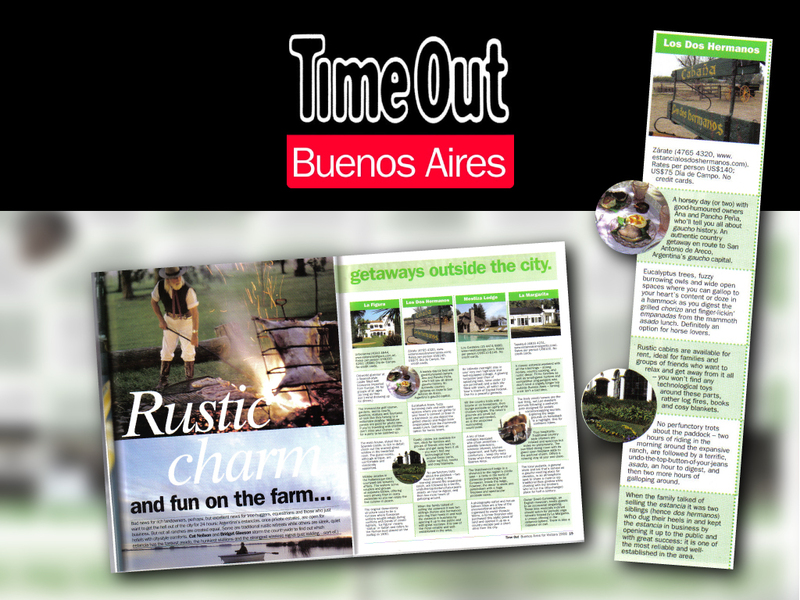 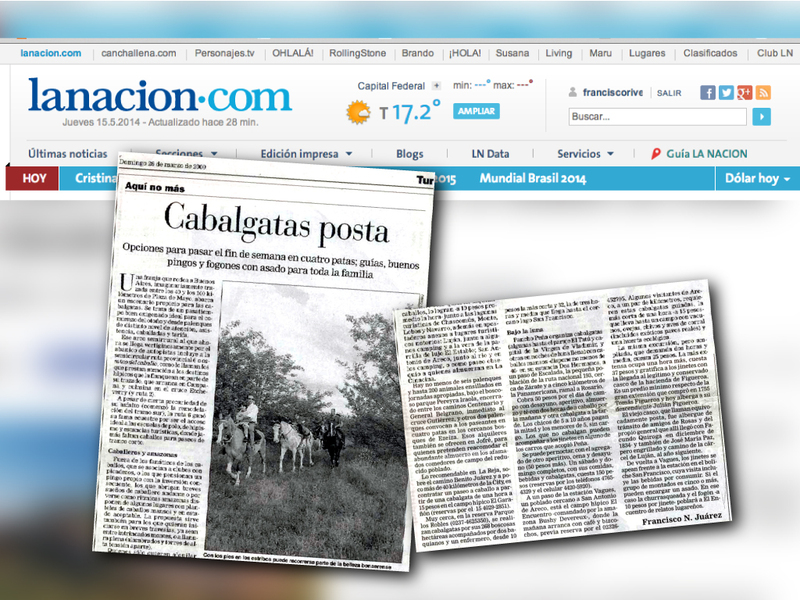 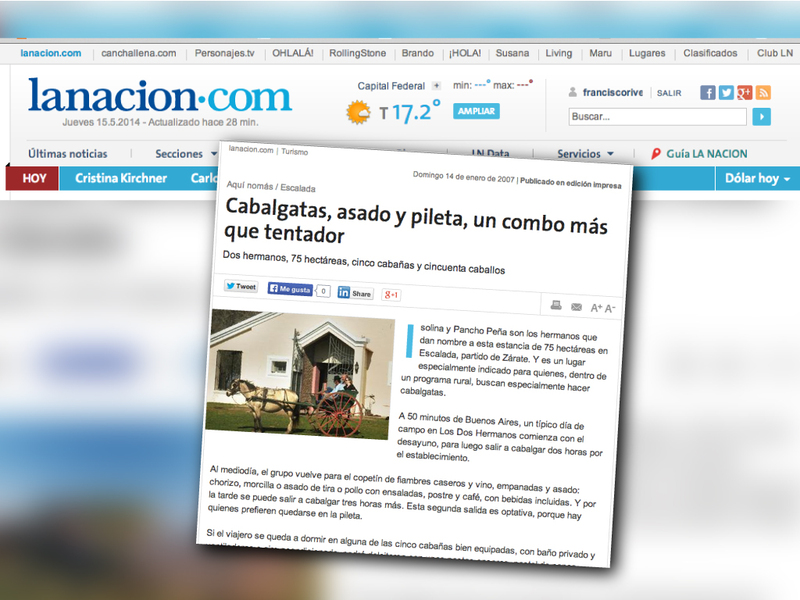 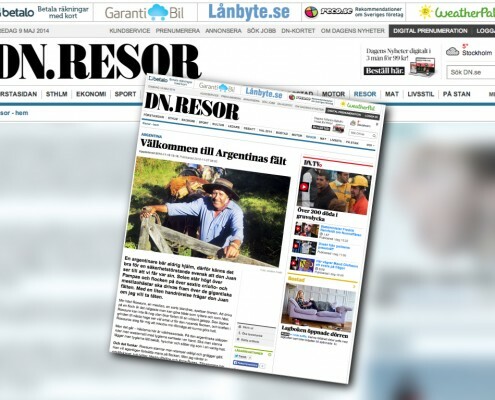 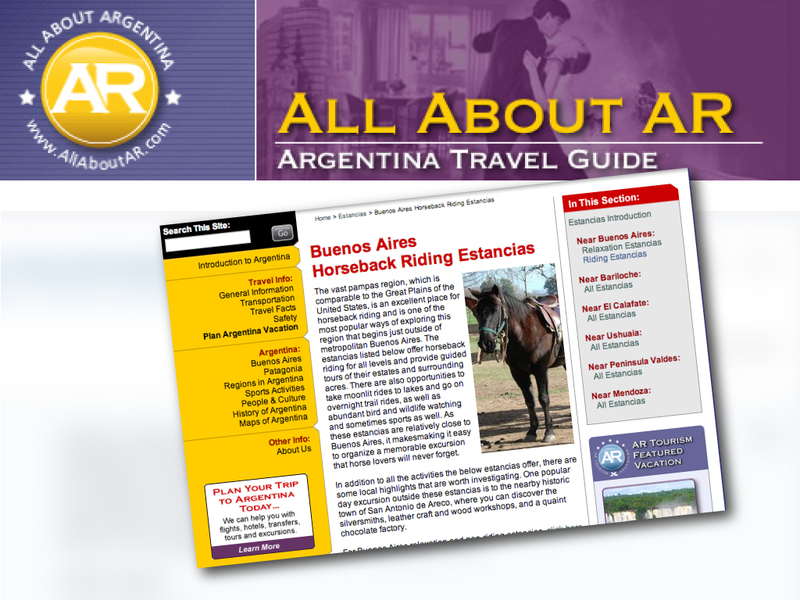 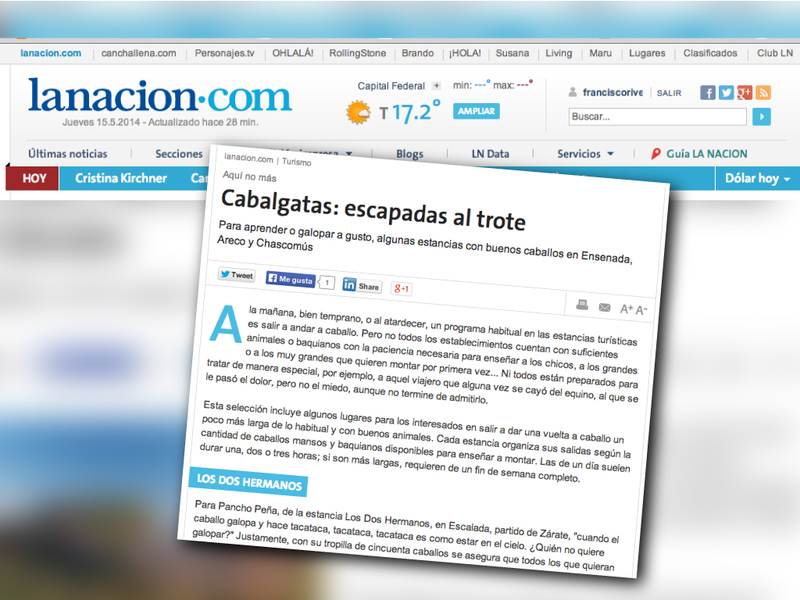 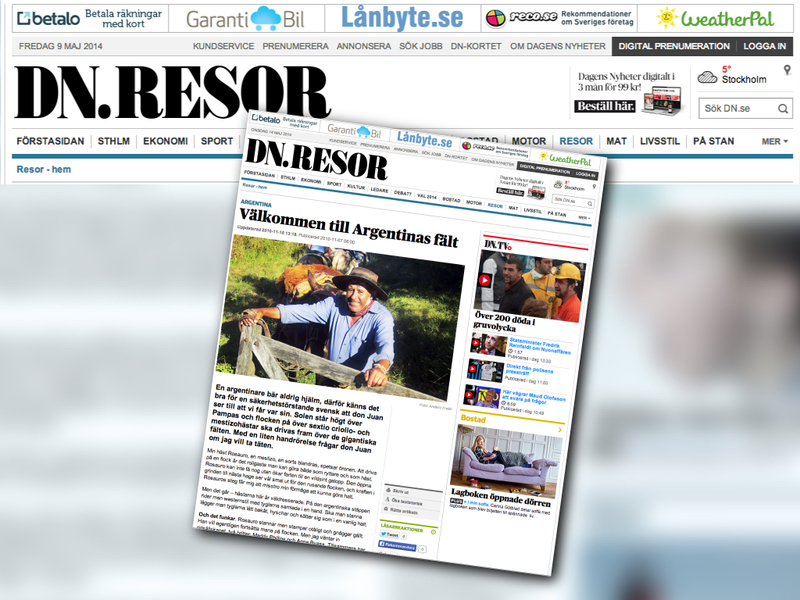 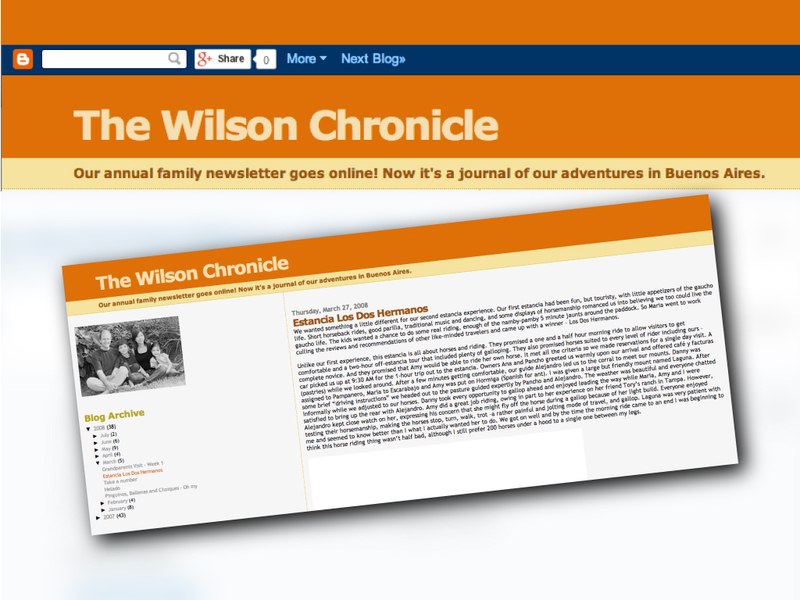 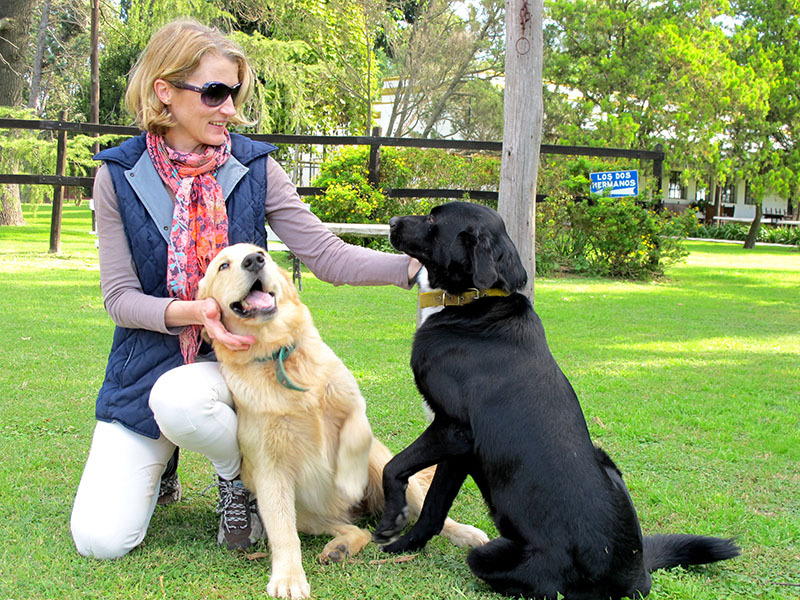 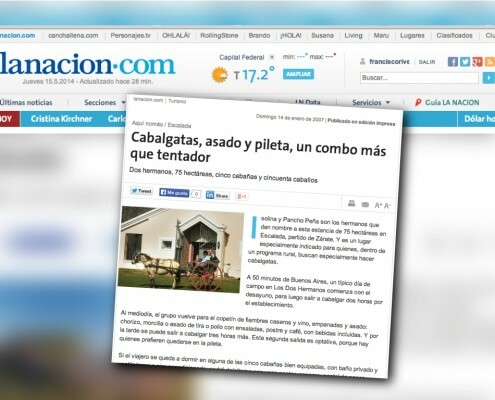 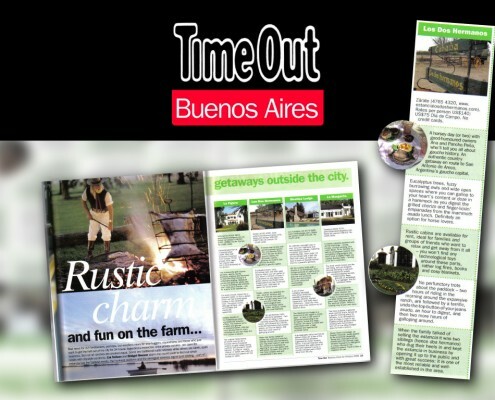 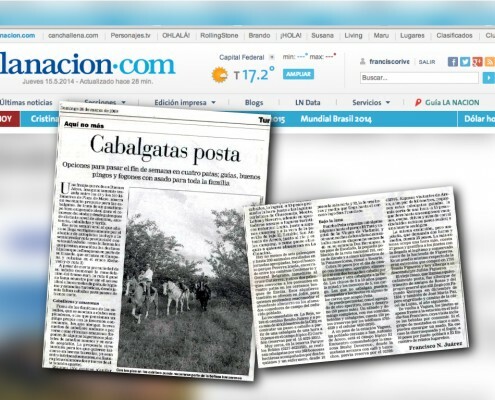 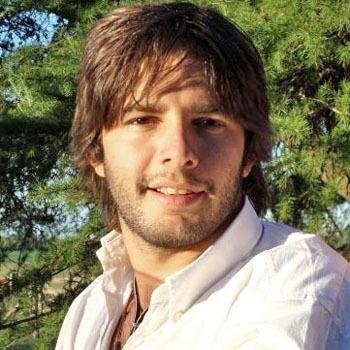 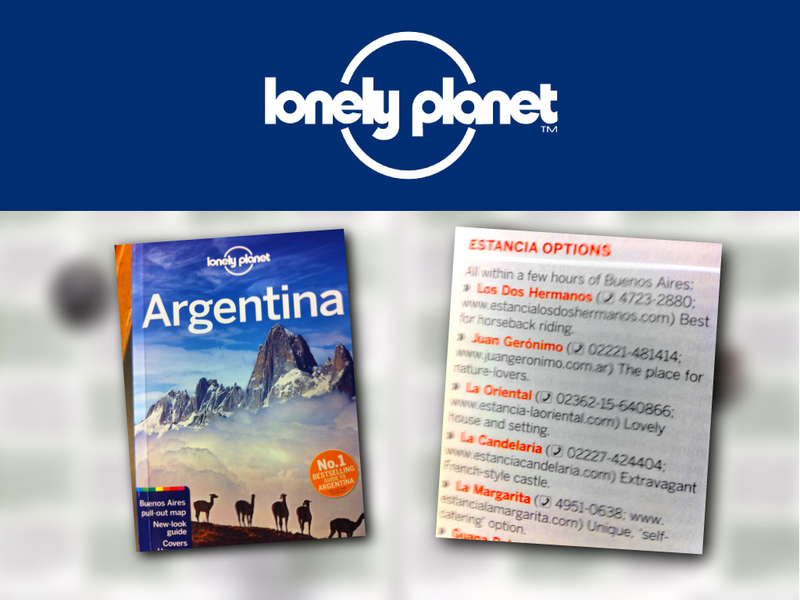 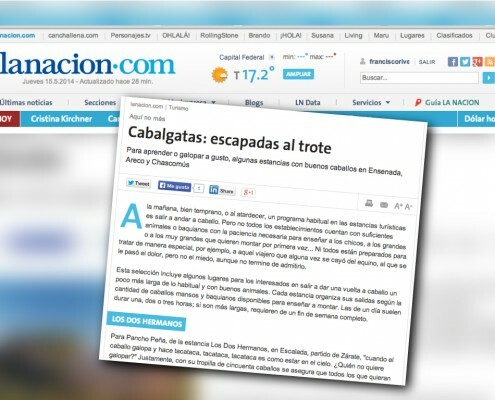 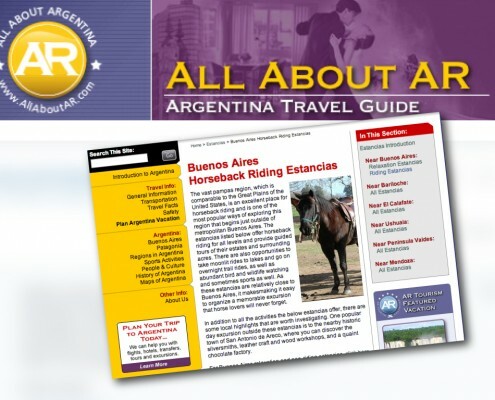 We also want to share the periodistic publishing of our Estancia, those articles that let more people know about and enjoy a first class experience in Argentina. 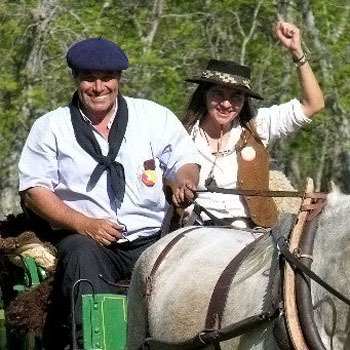 Pancho and Ana Peña, Josefina Peña, Carlos Peña, Francisco Peña, Rosario Peña and Estanislao Peña.